This is another post that started with a picture on Instagram. I saw Sarah Jampel's picture of kubaneh from the Breaking Breads cookbook and was utterly transfixed. 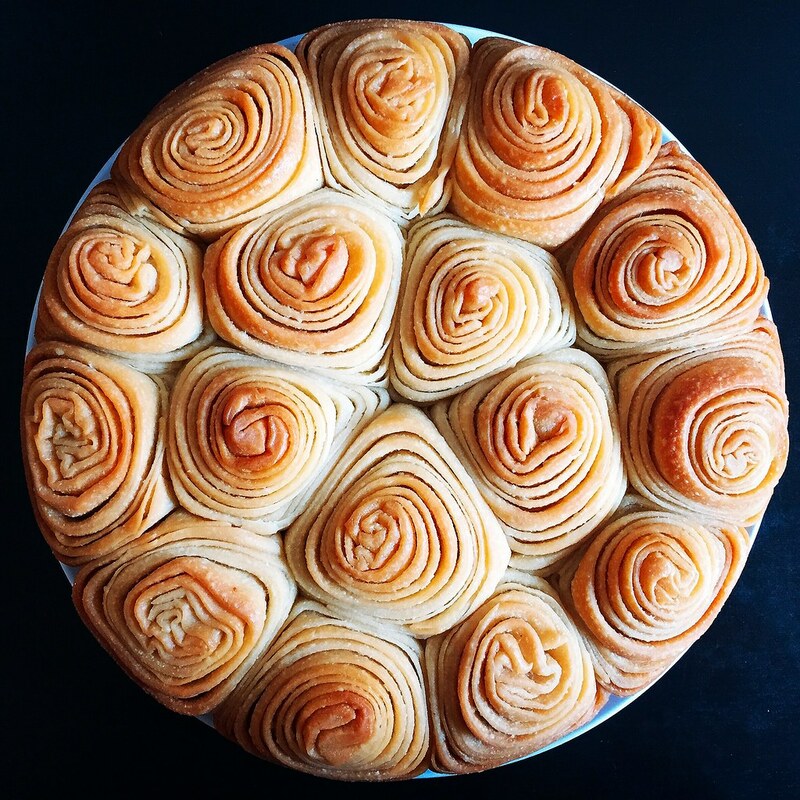 Then it showed up again on the Food52 feed in a picture for their store's twine holder, but all anyone wanted to know was what the beautiful, crazy, swirly bread was on the right. I managed to track down the recipe from my library's copy of Breaking Breads and tried it without even knowing what it was supposed to taste like. The original was a bit too salty for my liking, but the picture above garnered the most likes I've ever gotten for an Instagram post! I decided to take a cue from Molly Yeh's scallion pancake challah bread and try a hua juan version of kubaneh by brushing a mixture of scallions and sesame oil on the dough before rolling it up. I also used a fresher yeast this time, and the results are pretty spectacular if I do say so myself. The bread itself reminds me a lot of milk bread in that it's slightly sweet and very soft, yet the parts that get browned turn out a little crunchy from all the butter! 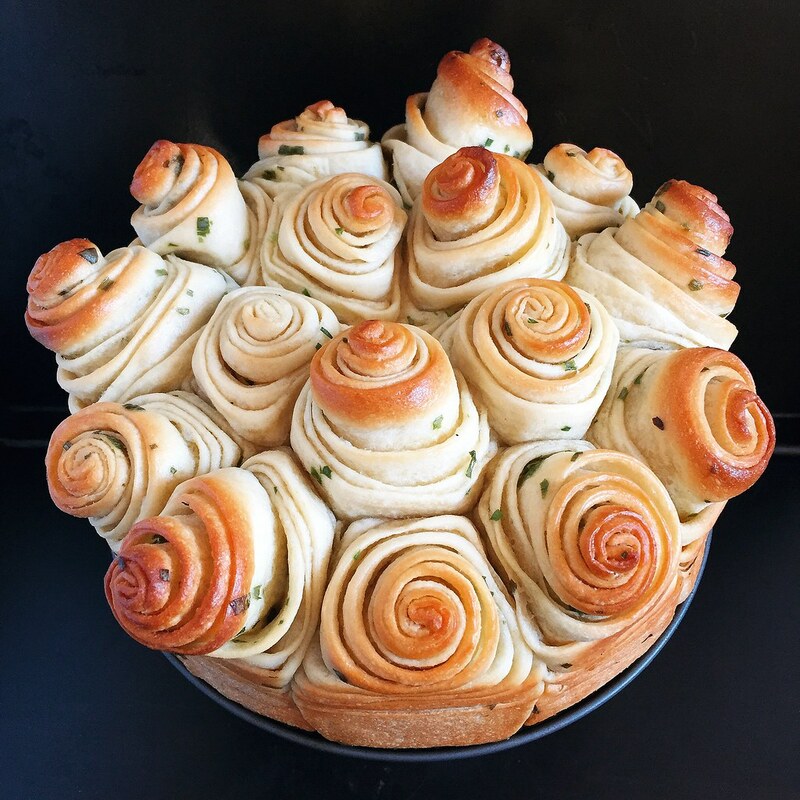 And even though you just apply a small smear of the sesame-scallion filling, it's so fragrant that the flavor gets infused throughout the whole roll. It's definitely better when warm, so if you're eating it a day or two later, microwave it for 10-20 seconds to rewarm it. Sprinkle the yeast over the water in a stand mixer bowl and allow to dissolve. Mix the flour, sugar, and salt in a separate bowl, then add to the yeast and water. Use the dough hook on low to combine the ingredients, then mix on medium-high until the dough comes away from the bowl cleanly. 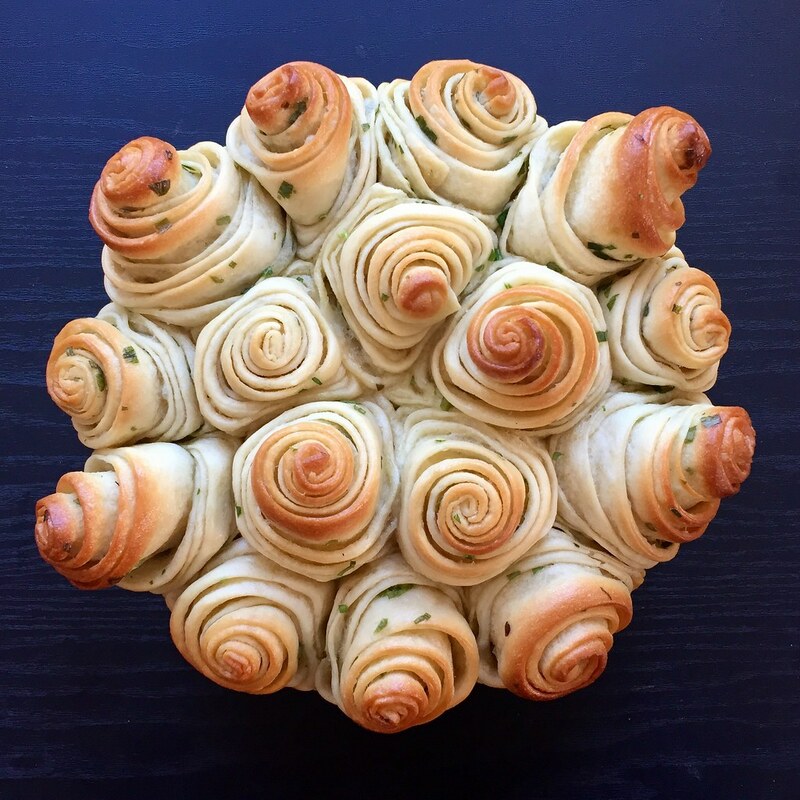 Give the dough a few folds to form a nice, tight ball. Cover the bowl and let rise until almost doubled, about 30 minutes. Lightly butter a large plate (I usually use the butter wrapper to do this). Divide the dough into 8 pieces, shape each into a tight ball, and place on the plate. Cover and let rise for another 30 minutes. Mix the sesame oil, scallions, salt, and sugar in a small bowl. Generously grease a 9" springform pan with the softened butter. Use about a tablespoon of the butter to generously grease a clean 11" x 17" rimmed baking sheet. Place one of the balls of dough on the baking sheet, smear a little more butter on top, and start pressing it out to cover almost the entire sheet. 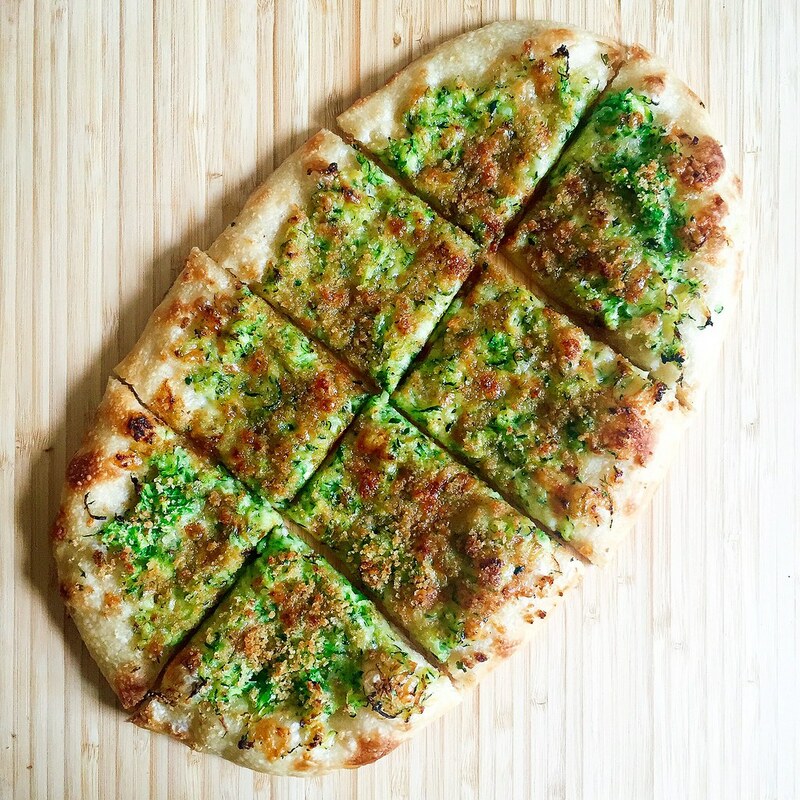 Sprinkle some of the scallion filling across the middle lengthwise third of the dough. 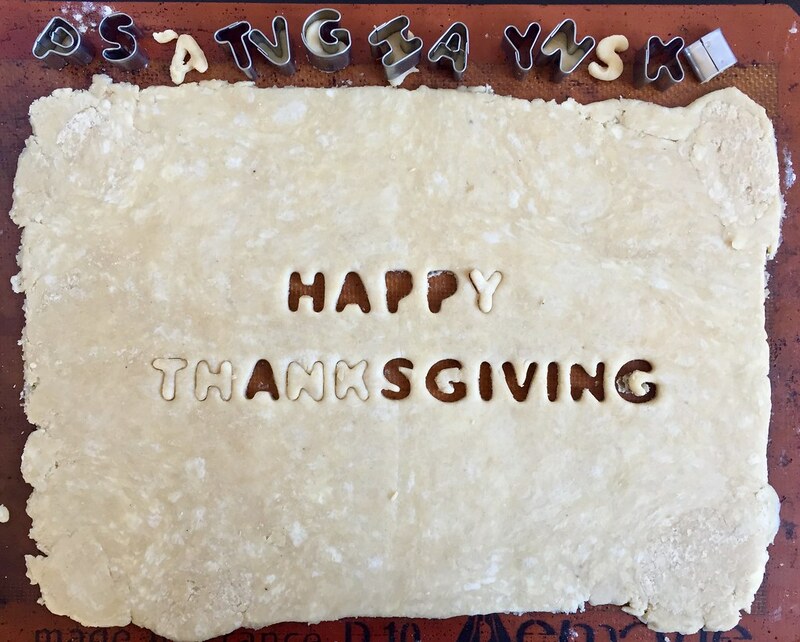 Fold the top third of the dough down and then the bottom third up (like a business letter fold, but lengthwise). 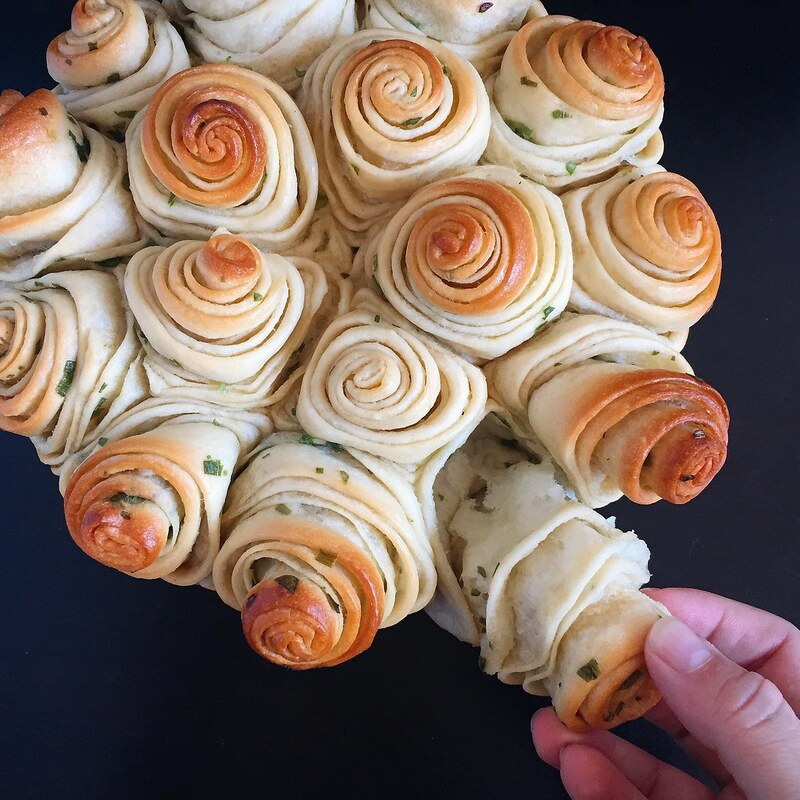 Roll the dough up into a tight spiral and cut in half. Place the cut sides up in the buttered pan. Repeat with the remaining balls of dough. Cover the bottom of the pan with a large piece of aluminum foil or place in another pan to catch any melted butter that leaks out. Cover the pan and let the dough rise a final time for 45 minutes. Preheat the oven to 350°F. Bake the bread for 15 minutes, then turn the heat down to 325°F. Bake for another 30-40 minutes, or until the tops are golden brown. If there is any butter left, melt it and add it to any remaining filling mixture and brush on top of the rolls. Serve warm. 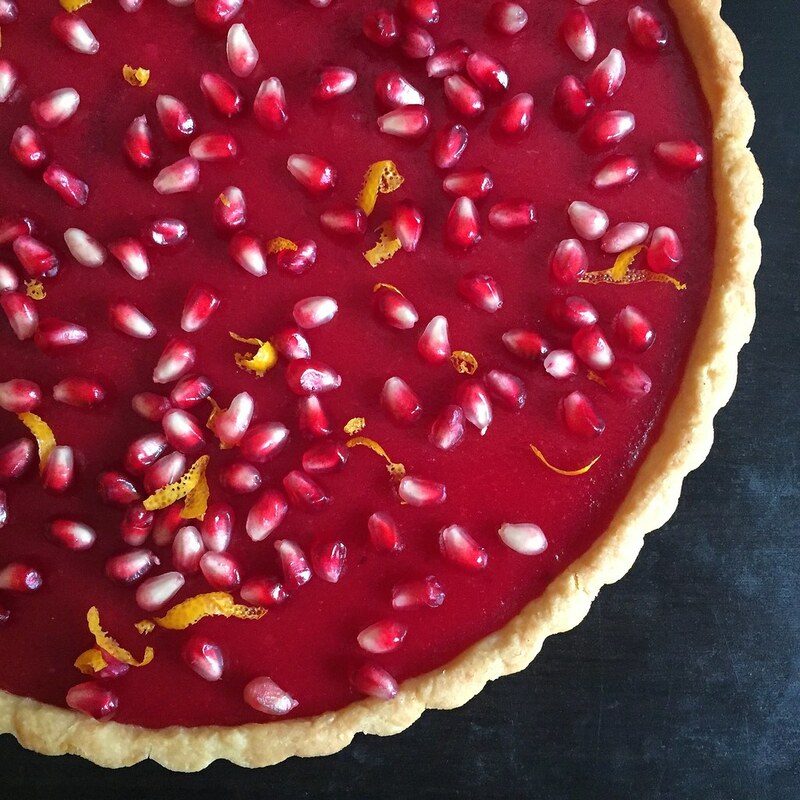 When I first saw NYT Food's Instagram post featuring a cranberry curd tart I knew I needed to make it if only because of how gorgeous it was. But each time I made it I couldn't figure out how to photograph it so that the picture would do it justice. Which meant I just kept making it over and over again. Awful, I know. 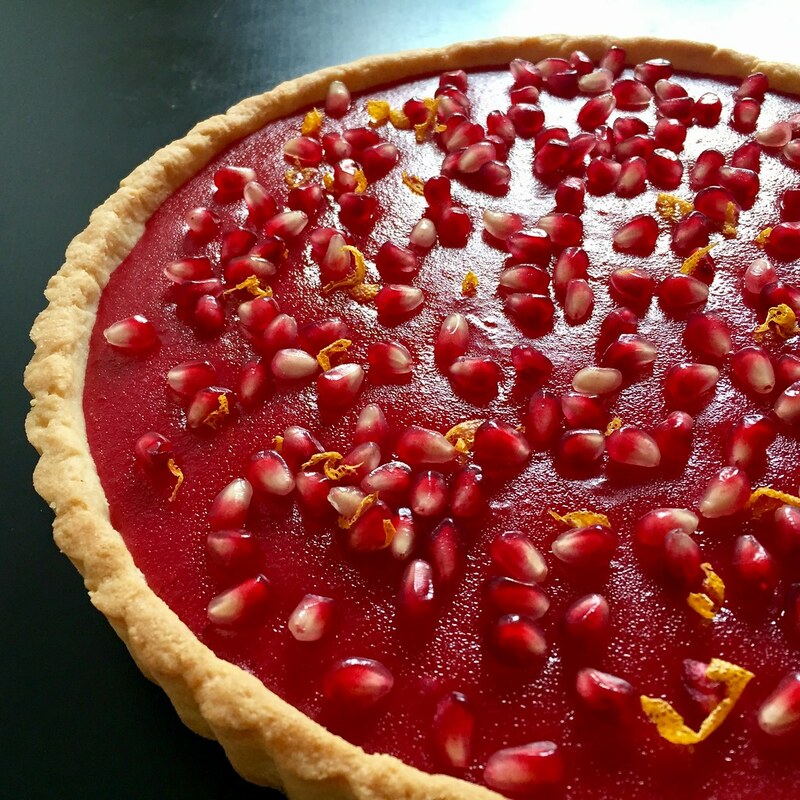 Then this last time I got a pomegranate in my Boston Organics delivery and decided to try sprinkling some on top of the tart for some contrast, and it finally looked as good as it tasted! They also give the tart a little crunch and freshness to cut all the richness. For the crust, instead of the using the hazelnut crust in the original recipe, I used Smitten Kitchen's "great unshrinkable sweet tart shell" because hazelnuts are expensive and it's pretty much a no-fail recipe. 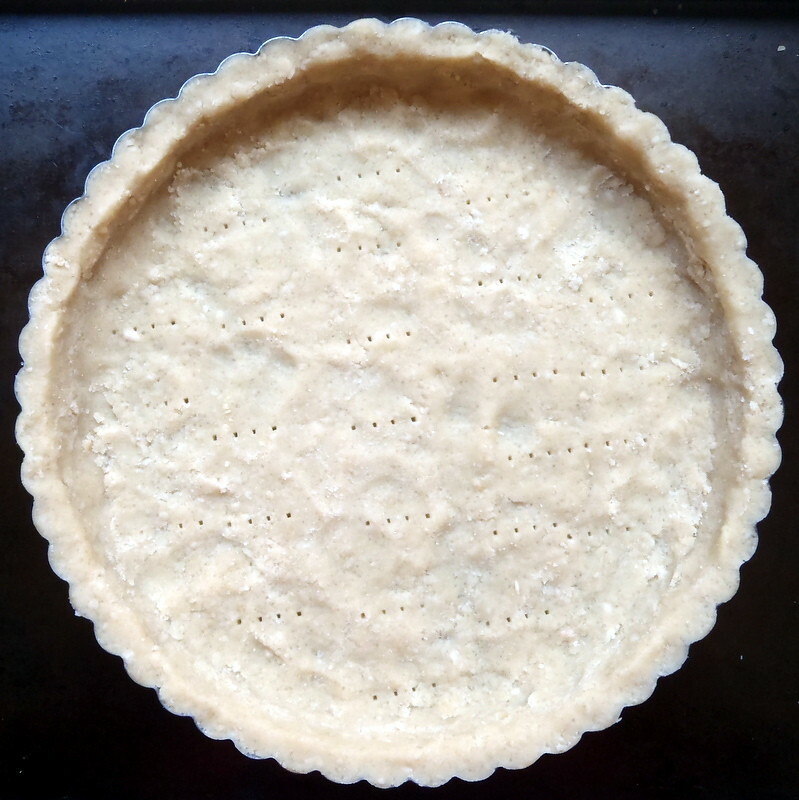 To save time and effort, I usually end up just pressing the dough into the tart pan right after making it (starting with the edges), docking it, and then freezing it for 30 minutes before blind baking it with the buttered aluminum foil on top. 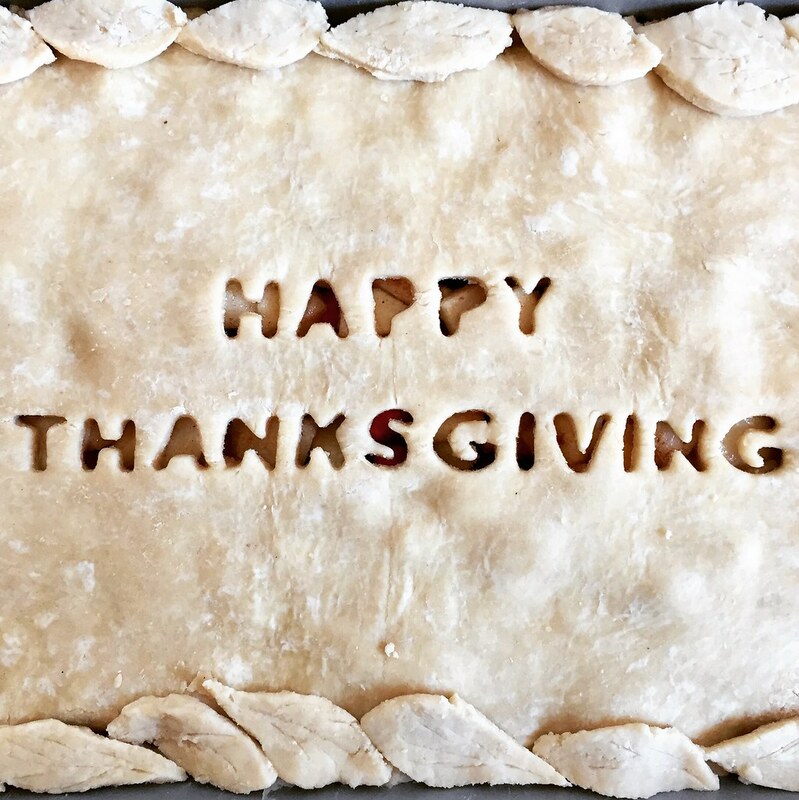 Feel free to use whatever tart crust you prefer, though, as long as it's blind baked beforehand. I can see Thomas Keller's pine crust tart crust being amazing for this recipe. For the cranberry curd, make sure that you don't overcook it after adding the eggs, because the egg whites curdle really easily if the mixture gets too hot. Since it's kind of hard to tell when it starts to thicken, the sign I look for is when steam starts rising off the top. You definitely don't want the mixture to start bubbling, and it helps to keep stirring to distribute the heat. Heat the cranberries, sugar, orange juice, and zest in a large saucepan over medium heat. Cook until the cranberries have popped and softened, about 10 minutes. Transfer to a food mill or sieve and push the cooking liquid into a medium bowl. Place butter in the saucepan and pour the liquid back into the saucepan. Whisk the eggs and egg yolks in the bowl, then add a couple of ladlefuls of the liquid into the bowl and whisk to temper the eggs. Pour everything back into the saucepan and cook over low heat, stirring constantly, until slightly thickened and steam just starts coming off. Cool to room temperature. Preheat the oven to 350°F. Pour the cooled curd into the blind-baked tart crust. Bake for 10 minutes to set the curd. 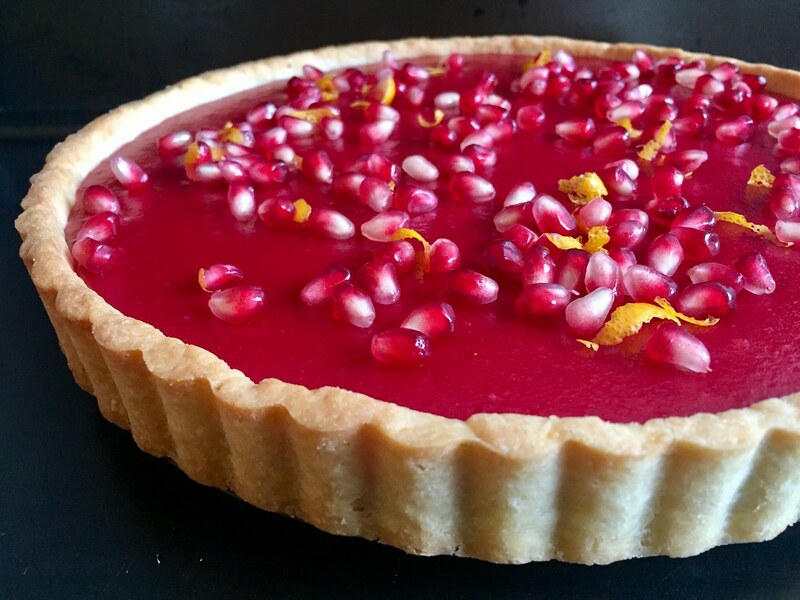 Allow to cool completely before garnishing with pomegranate arils. 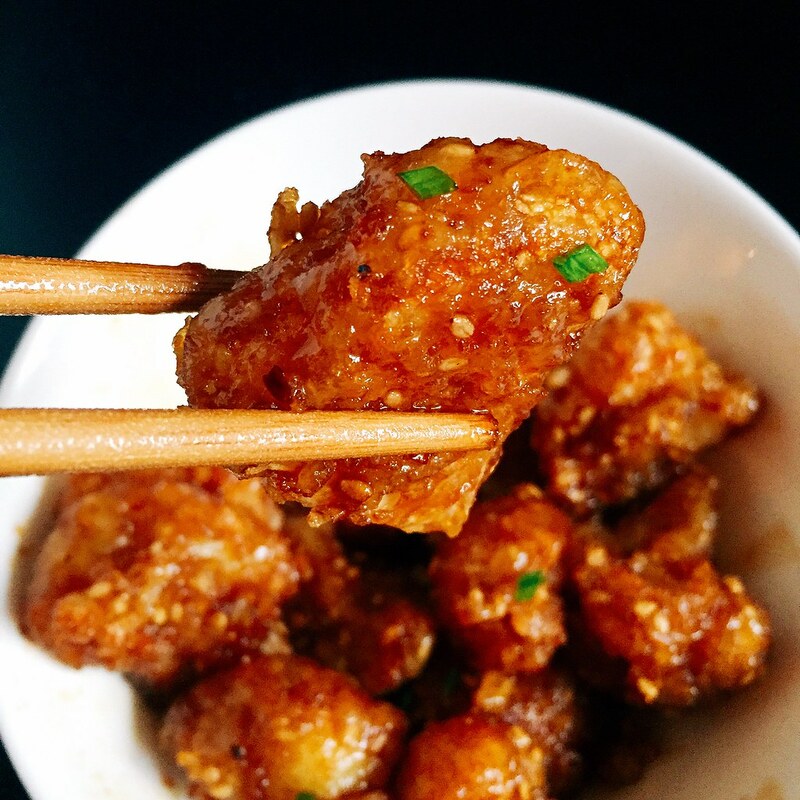 During my stint as a vegan (which became vegetarianism and then pescetarianism until I finally gave up this year and became an omnivore again), I would often crave Bon Chon chicken. That gloriously crispy, thin-skinned chicken with the amazing soy garlic glaze would haunt me, and I'll admit that I sometimes gave in. It was just too good to give up. 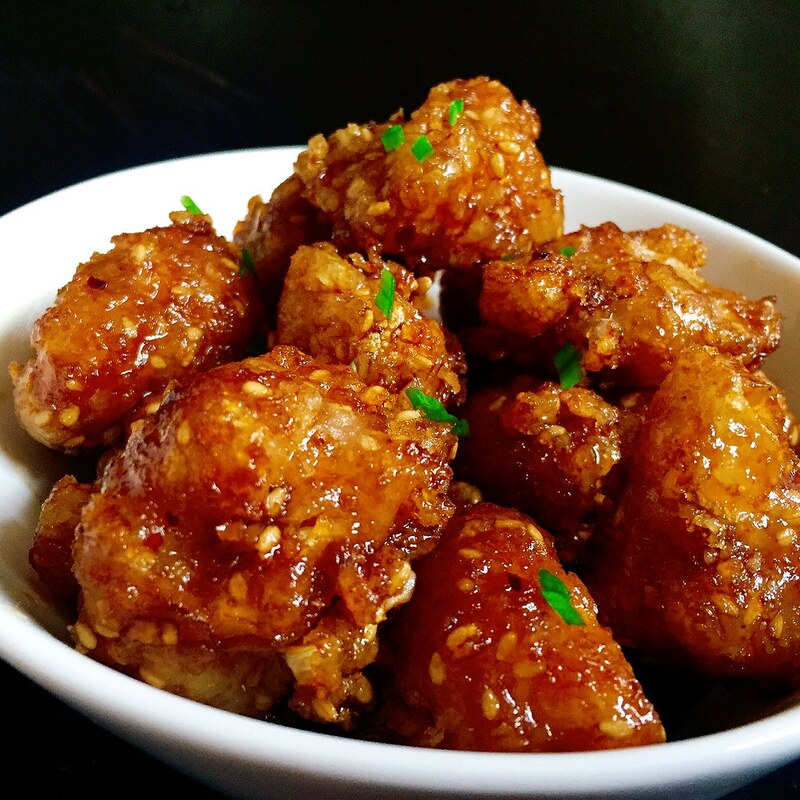 I wish I had had this recipe for Korean fried cauliflower back then, but to be honest, this substitute is so good, I might even prefer it over the real thing. I adapted the recipe from Serious Eats' well researched recipe and just reduced the amount of vinegar and upped the garlic in the glaze according to my own taste preferences. If you don't have the sesame seeds and/or finely shredded coconut to add to the batter, you can omit them, but they add some great texture to the cauliflower. Even though they're meant to be an appetizer, I ended up eating them with rice like I would with sesame chicken. And if you want to save any as leftovers, I would refrigerate the cauliflower after they're fried and drained. The next day, heat them up in the toaster oven and then toss them with the sauce; that way they will still be crispy. Combine everything except for the cornstarch in a small saucepan and heat over medium heat. Make a slurry with the cornstarch and 1 1/2 teaspoons water. Whisk into sauce and bring to a boil. Cook until the sauce is reduced and slightly thickened, about 3 minutes. Pour enough oil into a Dutch oven or large pot for it to reach at least 2". Preheat the oil to 350°F. Combine the cornstarch, flour, baking powder, sesame seeds, coconut, and salt in a large bowl and whisk until homogeneous. Add the water and vodka, and whisk to form a smooth batter. Add the cauliflower to the batter. Fry the cauliflower in batches, letting the excess batter drip off each one before you lower it into the oil. Remove with a slotted spoon when golden brown and let drain on a paper-towel lined plate. 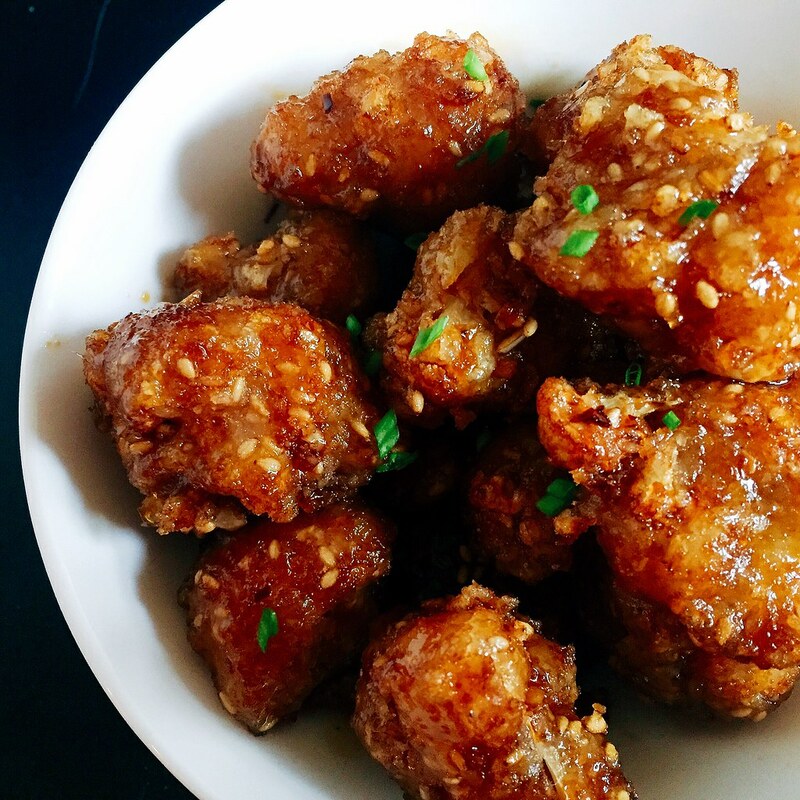 Toss the fried cauliflower with the soy garlic glaze and serve immediately. My friend Christine and I took our annual gorgefest stuffing of the faces eat all the things road trip up to Portland, ME on Labor Day and hit all our usual spots. 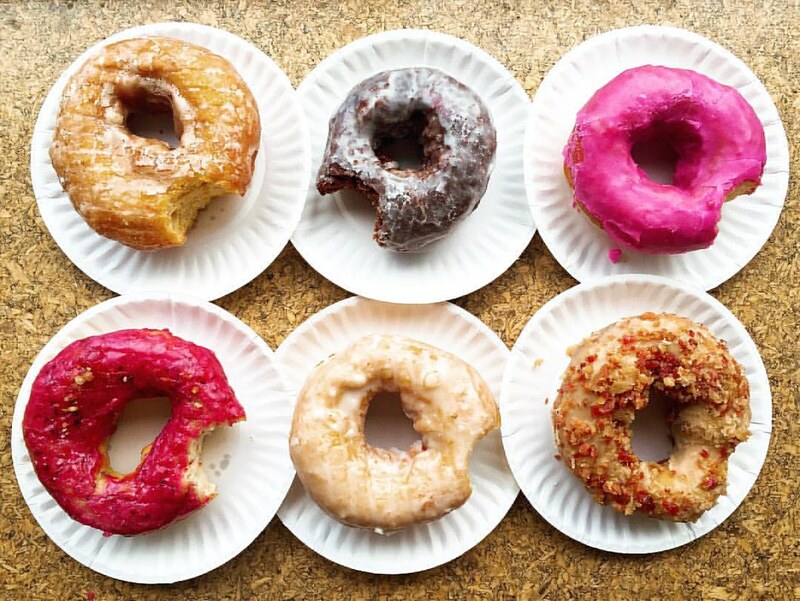 First was The Holy Donut for their Maine potato donuts. Here we have the sweet potato ginger glazed, sea salt chocolate, pomegranate, maple bacon, fresh lemon, and triple berry flavors. I think my favorite was the maple bacon. Then on to Eventide Oysters for their brown butter lobster rolls (which I've tried to recreate). We also tried the salmon poke this time, which I thought was prettier than it tasted. Since it was such a beautiful day, and we had some time before dinner, we took the ferry over to Peaks Island to see if there was anything interesting there. There wasn't. 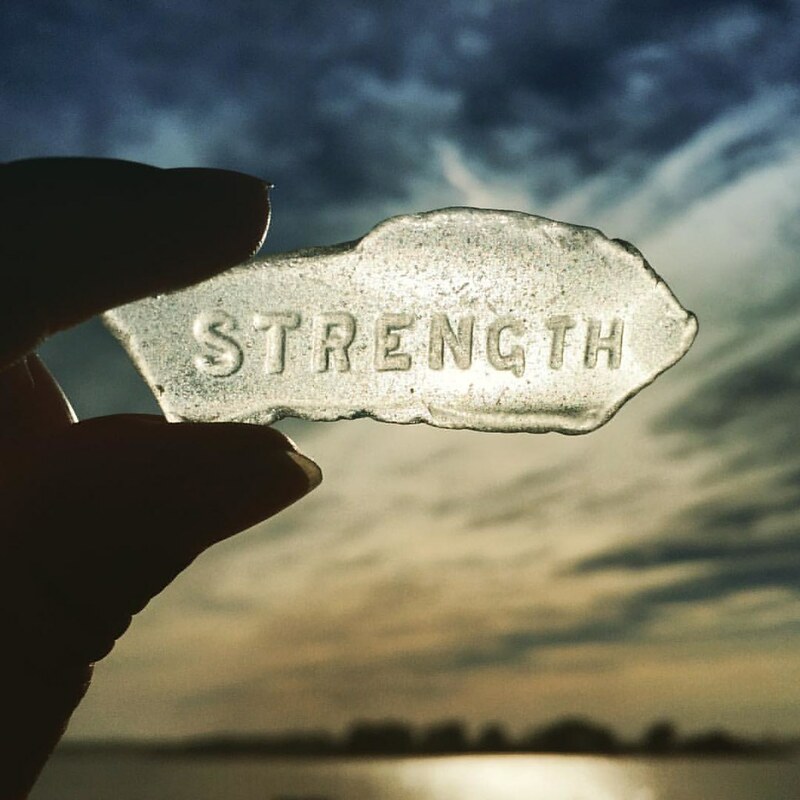 But Christine did find this awesome piece of sea glass there! After dinner at Duck Fat, we decided to grab some dessert from The Honey Paw, a new fusion restaurant next door to Eventide. 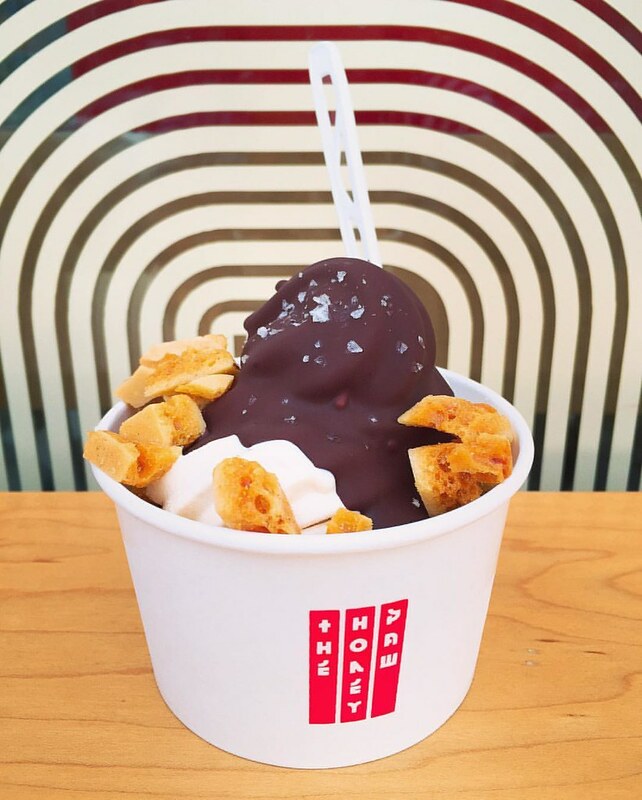 We tried the caramelized honeycomb soft serve with magic shell and honeycomb candy. It might have been the best thing we ate that day and is definitely going on our to-eat list for future trips! 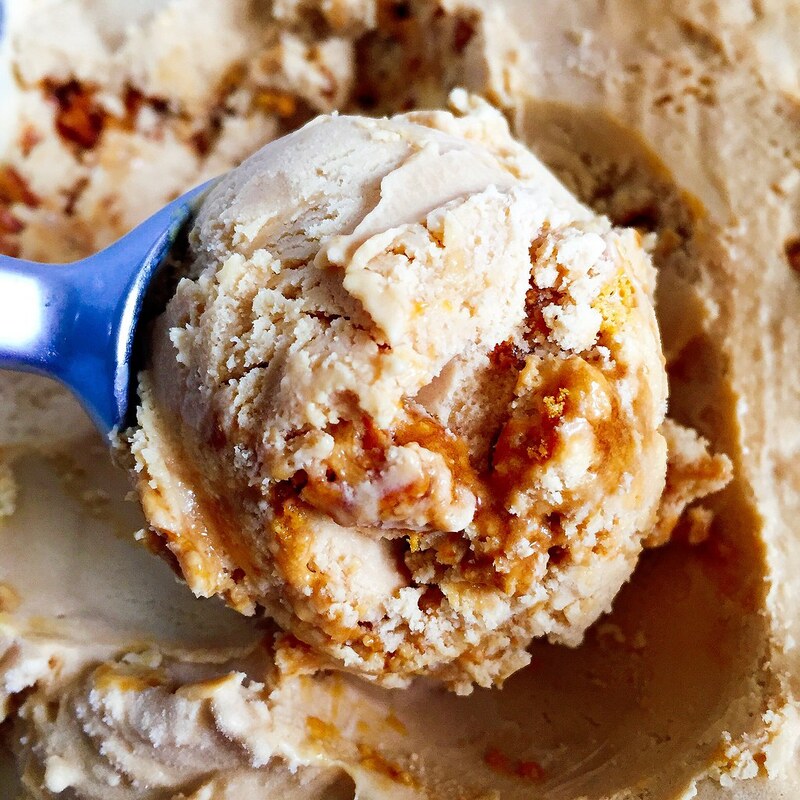 I tried to recreate it at home using one of Jeni's recipes as a guide, but I wasn't able to get that pure honey flavor that was the reason I loved the original version. 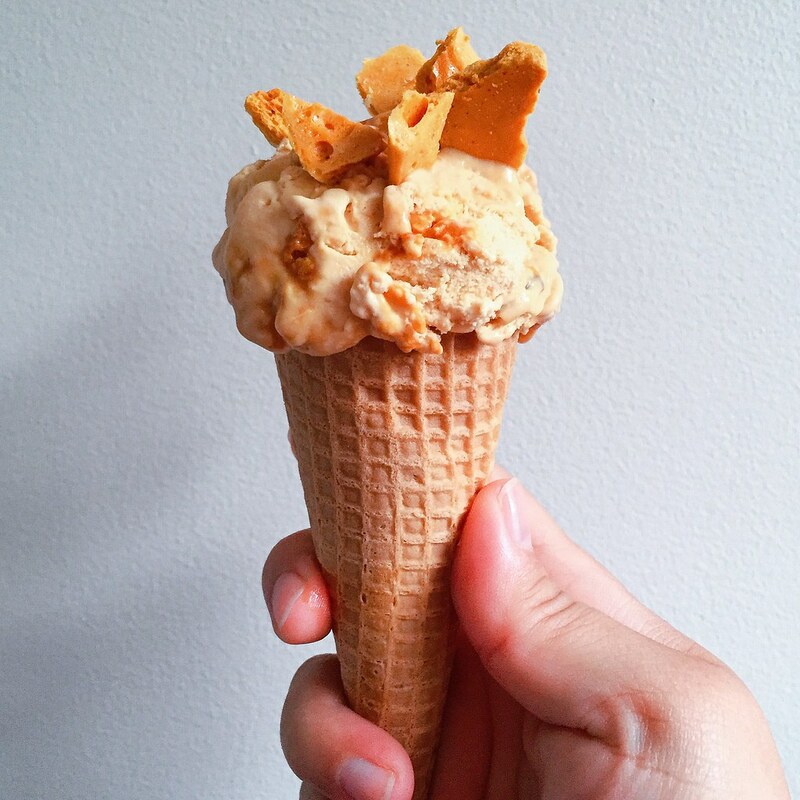 But then I realized it reminded me of Toscanini's burnt caramel ice cream, which is a very, very good thing. I also liked how the honeycomb candy--also made with one of Jeni's recipes--added a unique texture when layered in with the ice cream. Bring the sugar, water, honey, and corn syrup to a boil in a large saucepan over medium-high heat. When it reaches 300°F, remove from heat and stir in the baking soda. Pour into a parchment-lined baking sheet and let cool. Break into small pieces. You'll only need about half the amount that this recipe makes for the ice cream, but it's great eaten on its own or coated with chocolate. Store in an airtight container. Make a slurry with the cornstarch and 2 tablespoons of the milk and set aside. Whisk the cream cheese and salt in a medium bowl until smooth. Caramelize the honey in a large saucepan over medium-high heat. Stir in about 1/4 of the cream to loosen it up and then stir in the rest of the cream. Add the remaining milk and bring to a boil over medium-high heat. Boil for 4 minutes, then whisk in the cornstarch slurry. Bring the mixture back to a boil and cook until slightly thickened, about 1 minute. Gradually whisk the hot milk mixture into the cream cheese until smooth. Chill the mixture in an ice bath or in the refrigerator until cold. Churn according to your ice cream maker's instructions. 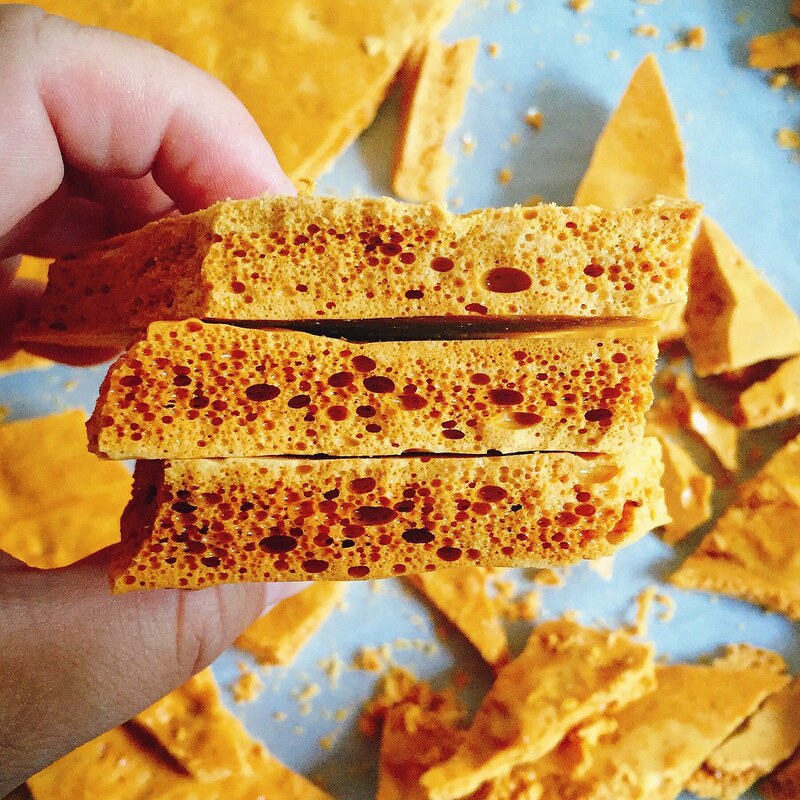 Pack the ice cream into a storage container, mixing in the honeycomb candy as you go. Freeze in your freezer until firm, at least 4 hours. I only needed one bite of the Portuguese Chicken Rice from Double Chin to know that I needed to figure out how to make it at home. I hadn't even ordered it myself; my friend Alvin was nice enough to let a bunch of us try his, and I'm so grateful he did. Sadly, it's not a very photogenic dish, but once you try it, you won't care. 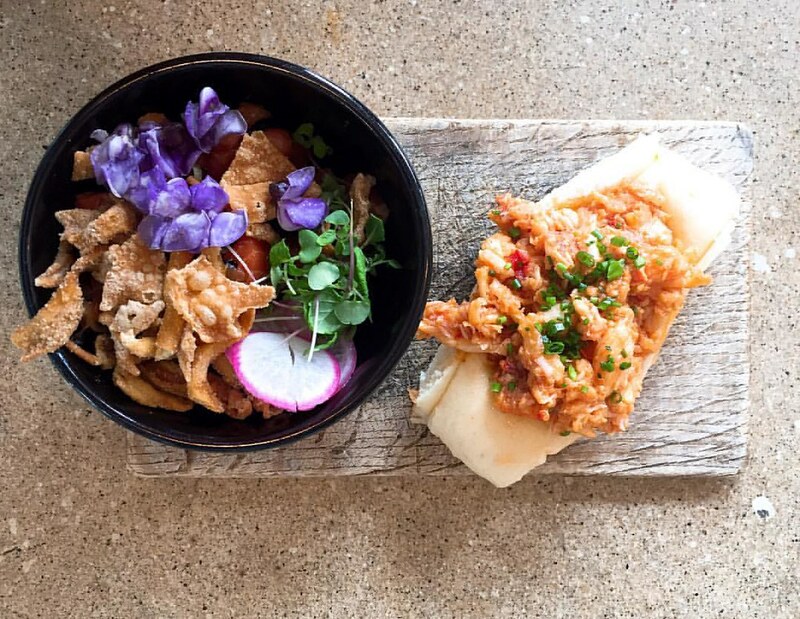 It starts with a layer of chicken fried rice topped with a mild coconut curry sauce and finished with a sprinkling of shredded cheese. Then everything goes under the broiler until it gets all bubbly and gooey. I know it's kind of strange to have cheese on an otherwise Asian dish, but it works so well in this case. 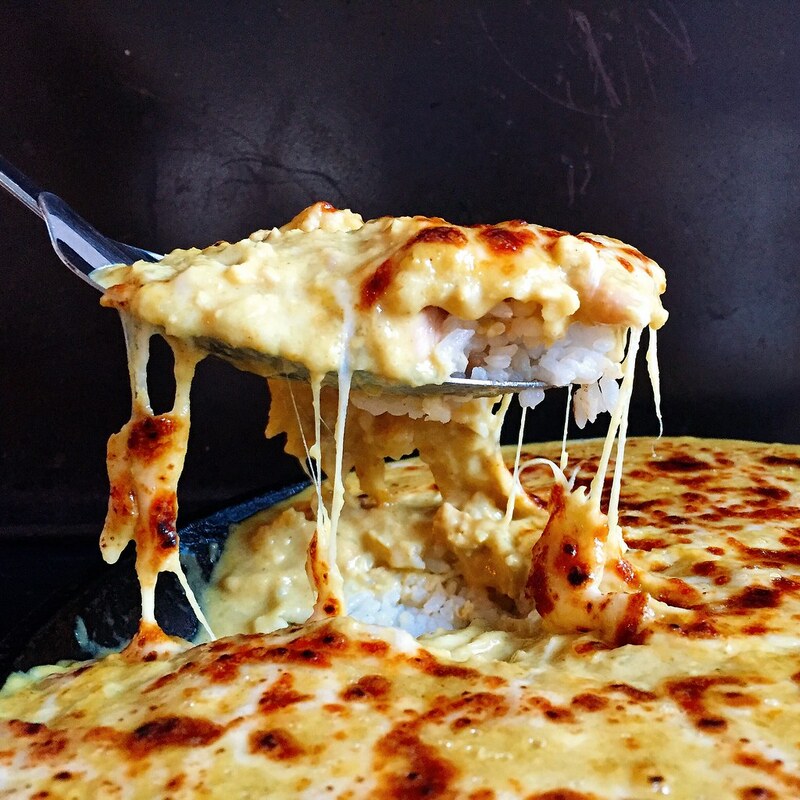 I think the key is to use a mild, melty cheese so that it doesn't overpower the rest of the dish. I ended up using a mix of mozzarella and provolone. I thought it was interesting that when I was looking for recipes on-line to use, a lot of them just listed "shredded cheese" as the ingredient without any reference to what kind of cheese. Perhaps in Asia there is just one kind of shredded cheese available! I ended up referring to Lady and Pups' version because I love everything else she does, and it seemed the most similar to what I had at Double Chin. The modifications I made were that instead of fish I used chicken and marinated it beforehand. I used chicken breast because I prefer white meat, but feel free to use chicken thigh meat if you prefer dark meat. I also made a couple of other modifications to her recipe based on what I had on hand (less scallions and water instead of milk) and taste preferences (half the amount of shallots). Please note that this makes quite a bit of food. 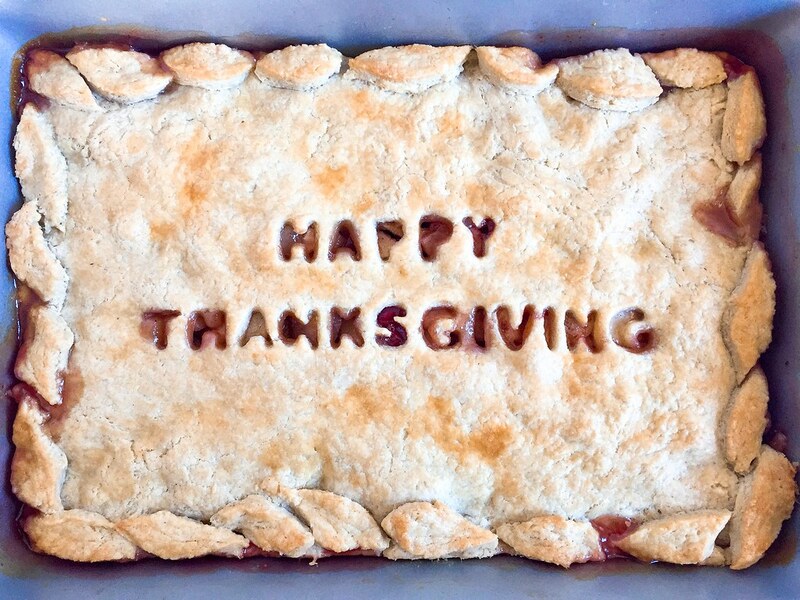 Mandy's original recipe said that it serves 2, but it would probably be more like 6 Joy-sized servings. And if you're wondering why it's called Portuguese chicken rice, I think it has to do with the fact that Macau was a Portuguese colony up until the end of the last century. Apparently this dish is very popular in Hong Kong cafes, and I remember seeing something similar at one of my favorite eateries in Taiwan. Mix all the ingredients except for the oil and marinate for 20 minutes. Heat the oil over medium-high heat and cook the chicken until lightly brown. Save 2/3 of it for the fried rice and finely chop the rest for the sauce. Heat the oil over medium-high heat in a large pan and add the eggs. Immediately add the rice and mix to coat. Once the rice is heated through, add the scallions, salt, and white pepper to taste. Add the reserved chicken and mix until even. Remove from heat and set aside. Use a small blender to puree the oil, shallot, and garlic cloves. Mix with the grated ginger and butter and cook over medium heat in a saucepan for a few minutes until very fragrant. Add the curry powder, onion powder, coconut, and flour continue to cook for a few more minutes to toast the spices. Whisk in the coconut milk and water and bring to a boil. Simmer for 5-7 minutes until thickened. Stir in the chopped chicken and 1 cup of the cheese. Preheat the broiler. 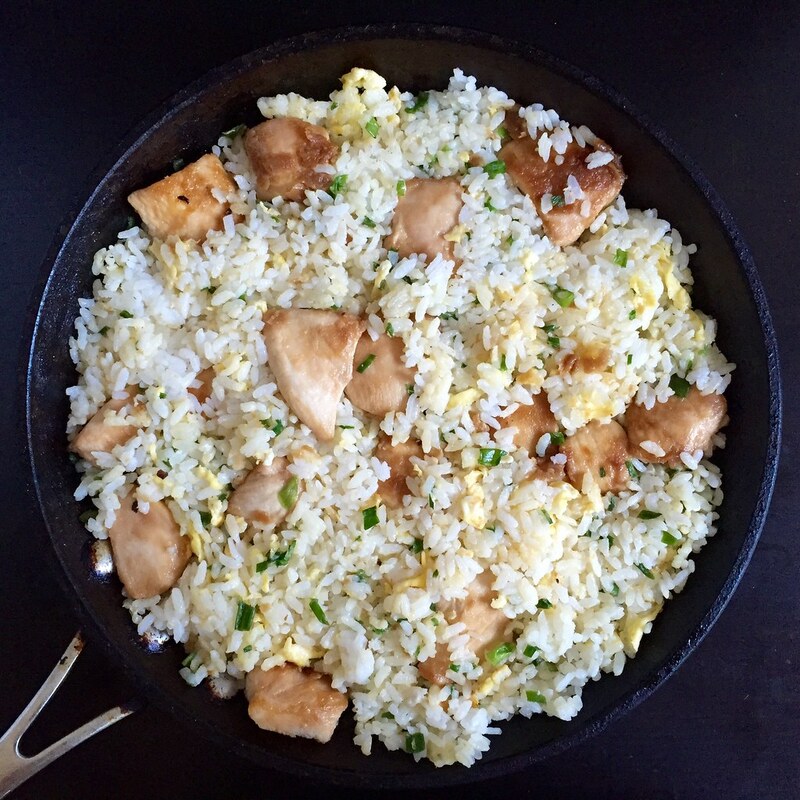 Transfer the fried rice to a buttered casserole dish or oven safe pan. You can also use multiple smaller dishes. Pour the curry sauce over the rice and top with the remaining 1/2 cup of shredded cheese. Broil for a few minutes until browned in spots and bubbly. Serve immediately. I'm ashamed to admit that one of my all-time guilty pleasures is Totino's Party Pizza. There's just something I love about the extra crispy crust, the barely there tomato sauce, and even the painfully artificial cheese. It's probably a good thing that it's not sold anywhere near where I live, otherwise I'd probably be eating it way too much. 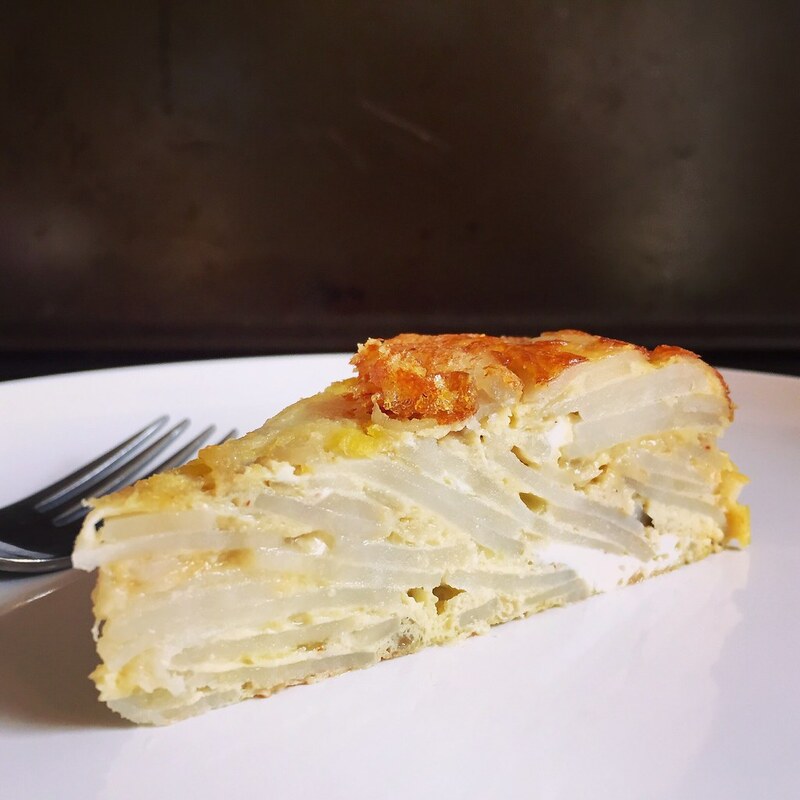 That hasn't stopped me from trying to figure out how to replicate it at home, though, and this recipe from Serious Eats is the closest I've gotten. While I still prefer Ken Forkish's Same Day Straight Pizza Dough for its chewiness and flavor, I like the use of flour tortillas in this recipe for a quick and easy alternative. In order to get the tortilla extra crispy, it's cooked first on the stove top in a skillet that has a diameter the same size as the tortilla. You'll want to use one that can be transferred to the oven, like a cast iron skillet, because it's going under the broiler next to get the cheese all melty. Since I don't usually have pizza sauce on hand, I've been using ground peeled tomatoes and then adding a sprinkle of kosher salt and a drizzle of olive oil. 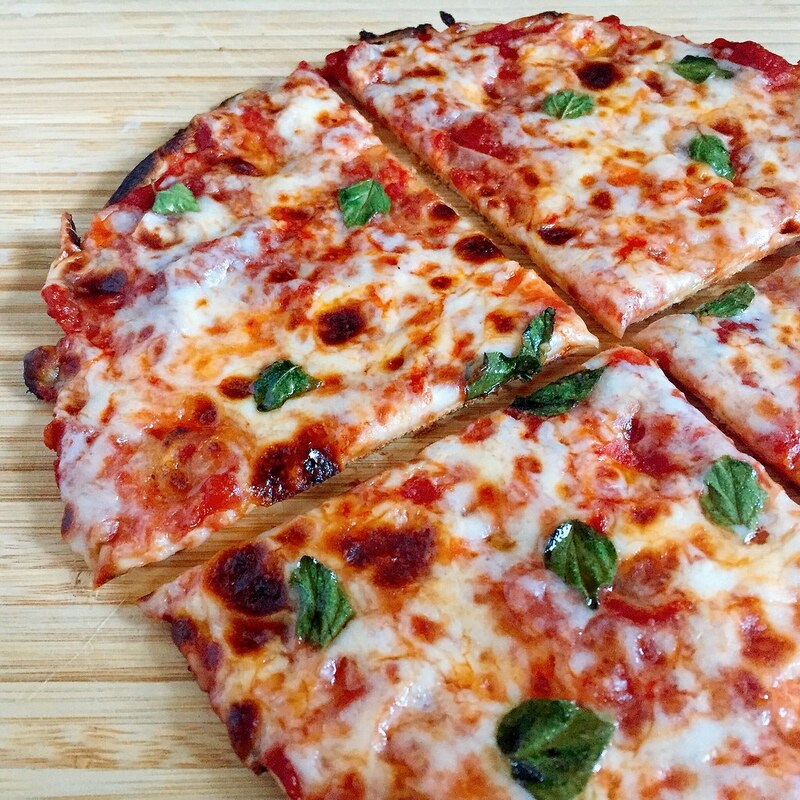 The original recipe calls for fresh basil as a final topping, but I tried using some of the fresh oregano I got in my Boston Organics delivery this week, and I found that it makes the pizza taste even more like Party Pizza. Add the olive oil to a cast iron pan with an 8" diameter and heat over high heat. Once it shimmers, reduce the heat to medium and use a folded paper towel to coat the bottom of the pan with the oil. Wipe the excess oil onto the rough side of the flour tortilla. Place the tortilla rough side down in the pan. Spoon on the pizza sauce and spread all over, right up to the edge of the tortilla. Sprinkle on the cheese and top with a few oregano or basil leaves. 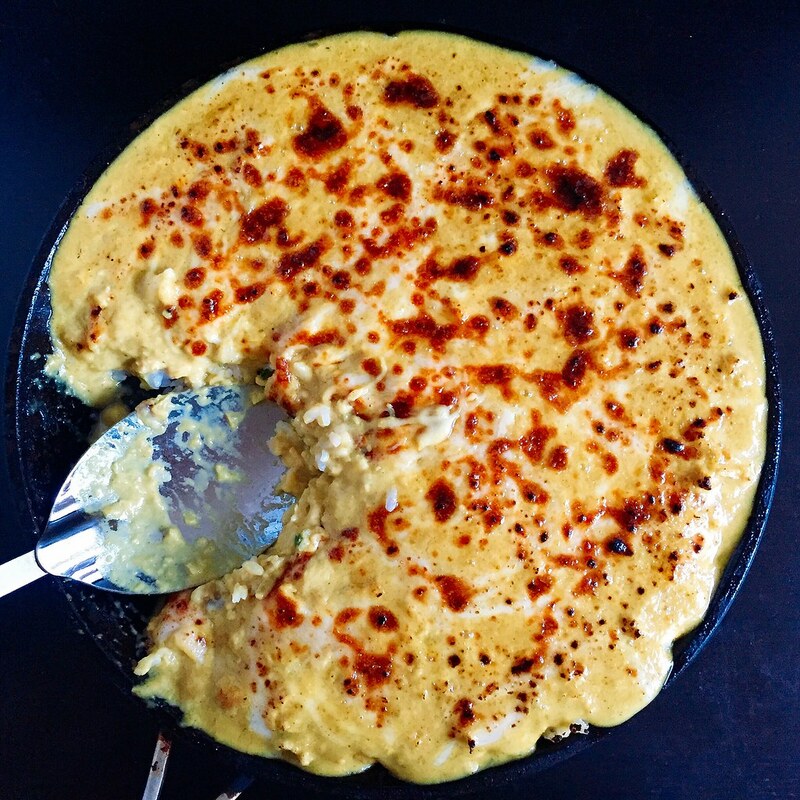 Move the pan to the broiler and broil until the cheese is melted and bubbly, just a few minutes. Use a spatula to check if the bottom is crispy enough to your liking. If not, return to the stovetop and continue to cook until crispy enough. Transfer to a wooden cutting board, slice, and serve! I used to cringe a little whenever I got zucchini or summer squash in my Boston Organics delivery because while I liked the vegetable enough not to add it to my "No List", I didn't like it enough to know what to do with it other than to stir fry it with garlic or grate it into an amnesty bread. 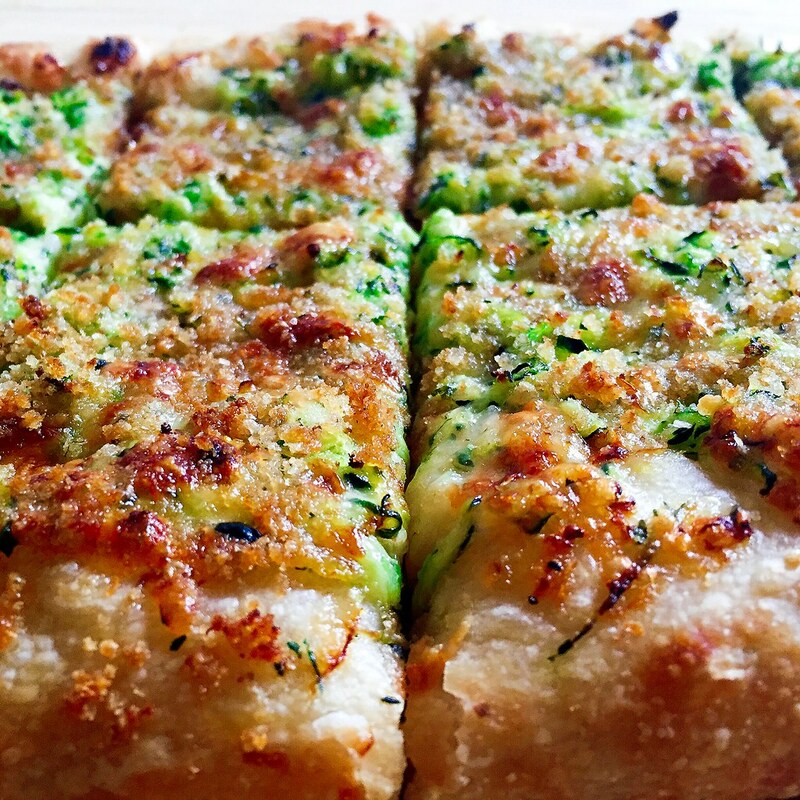 But that all changed when I saw Smitten Kitchen's post about summer squash pizza. 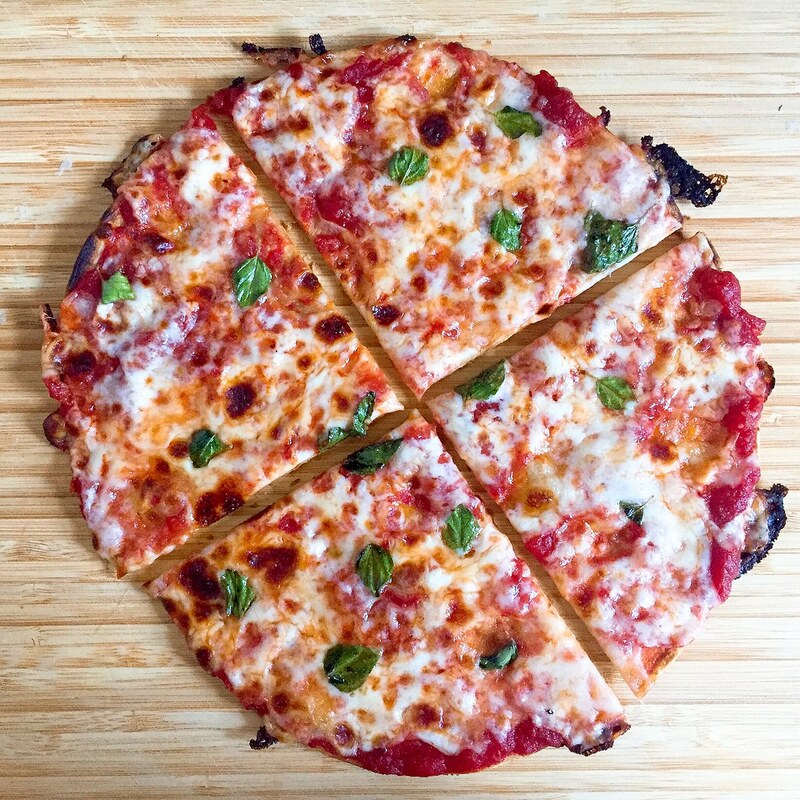 I tweaked the recipe (which is originally from Jim Lahey of no-knead bread fame) a little by using my favorite pizza crust instead of the one in her post because I already had some on hand. I also tossed the breadcrumbs in a little olive oil for a little extra crunch and to protect it from burning too fast. I wasn't really sure about having to buy the Gruyere cheese and even made it for the first time without the cheese and substituting with some minced garlic and olive oil (which, by the way, ended up being pretty darn good and worth trying if you don't eat cheese). But then I caved in and got a small block of Gruyere. And boy oh boy was it amazing. Divine. Glorious! In the oven, the cheese melts and binds the shredded zucchini together in a holy matrimony of texture and flavor. It's simply perfect. 1 medium zucchini or summer squash, about 1/2 lb. Place a pizza stone on an oven rack set at the top 1/3 of the oven. Preheat the oven to 500°F. Trim off the round end of the zucchini and using the other end as a handle, shred the zucchini on the coarse holes of a box grater. Squeeze the shredded zucchini in your hands to remove the water and transfer a fistful at a time to a small mixing bowl. Add the salt and mix well. Let sit for 20-30 minutes so that more water is released. Squeeze the zucchini again until you get out as much water as possible. Mix with the Gruyere cheese. Mix the breadcrumbs with a little olive oil, just enough to moisten and clump them together a little. 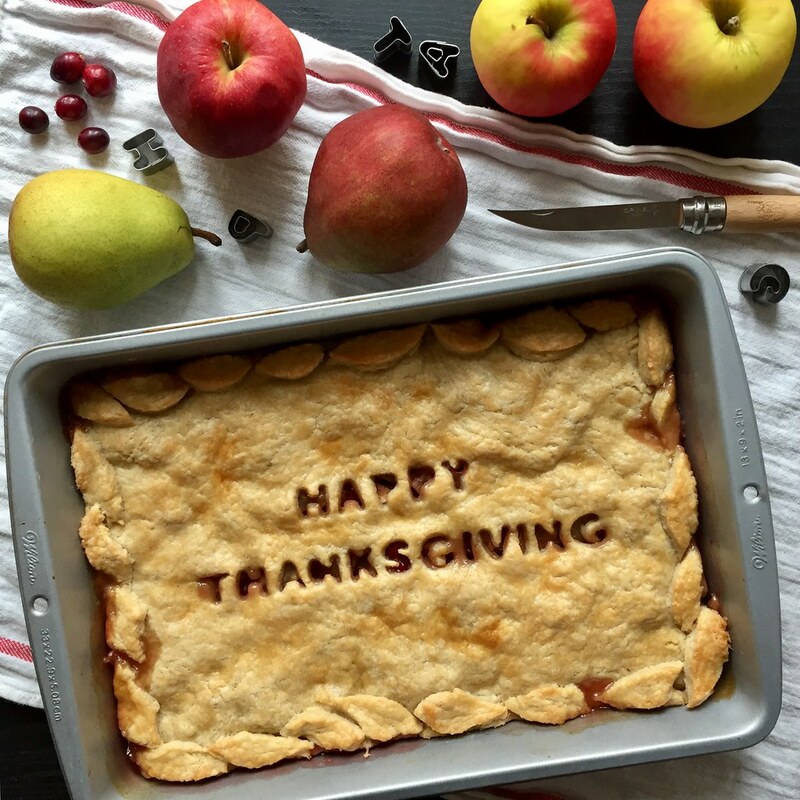 Stretch the dough onto a parchment paper-lined flexible cutting board. 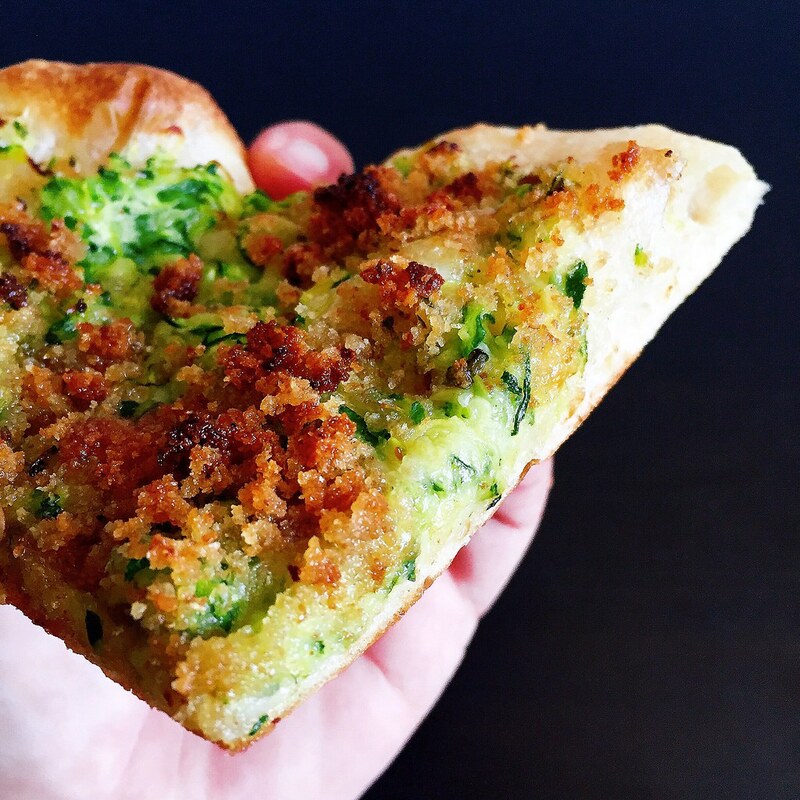 Top with the zucchini-cheese mixture then sprinkle on the breadcrumbs. Slide the pizza (still on the parchment paper) onto the pizza stone and bake for 10 minutes, until the cheese has melted and the breadcrumbs are golden. 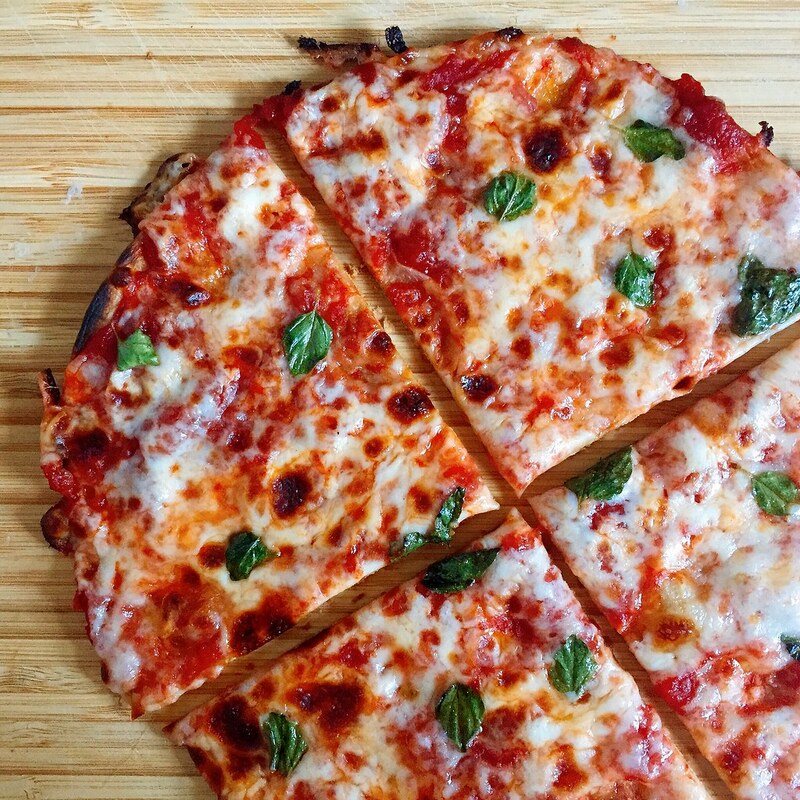 Use tongs to slide the pizza with the parchment paper from the pizza stone onto a cutting board. Slice and eat! This is one of the original recipes in the cookbook that I made for my mom's Christmas gift 8 years ago. I would've shared it earlier, except I thought I'd shared it already! 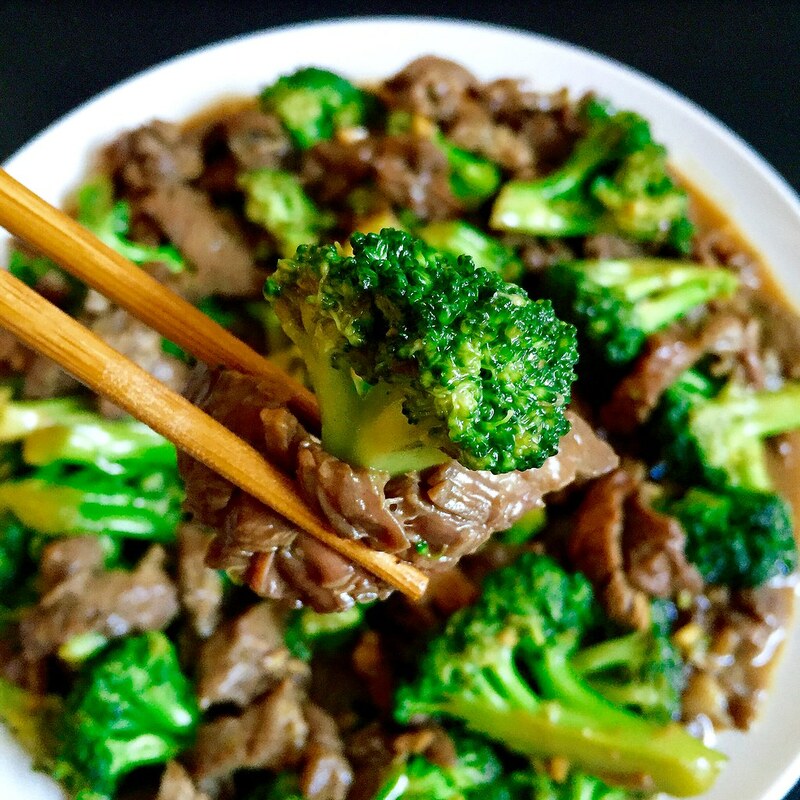 It's a classic dish to order from a Chinese restaurant--velvety strips of marinated beef stir fried with tender crisp broccoli in a flavorful brown sauce--and perfect served over steamed white rice. To keep the beef tender and not chewy, it's important to slice the strips against the grain. The addition of cornstarch in the marinade further helps improve the texture of the beef. 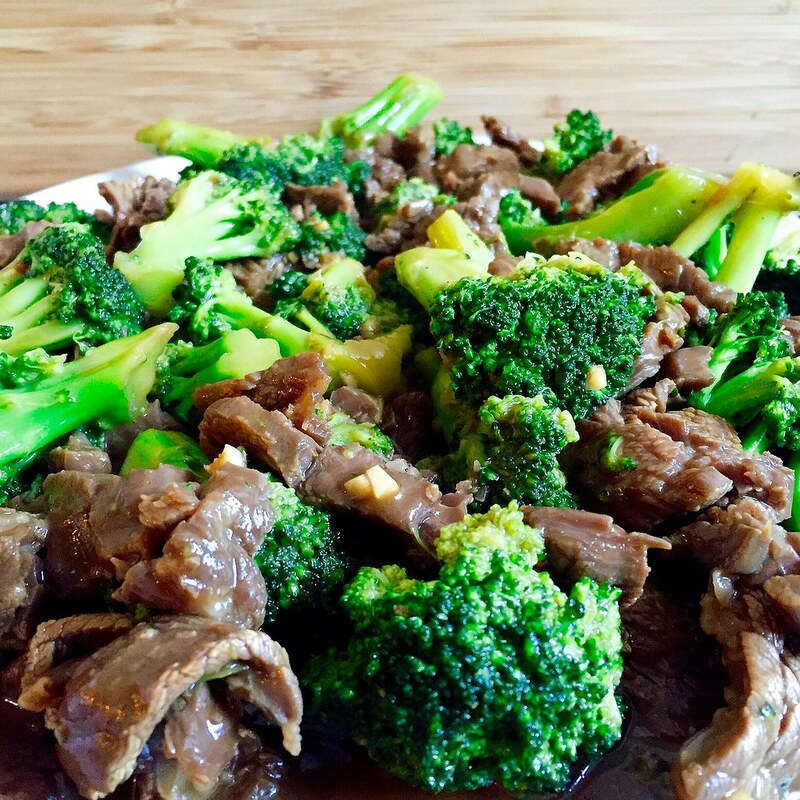 Since the broccoli takes a lot longer to cook than the beef, it is cooked separately while the beef is marinating and then added back in at the end. 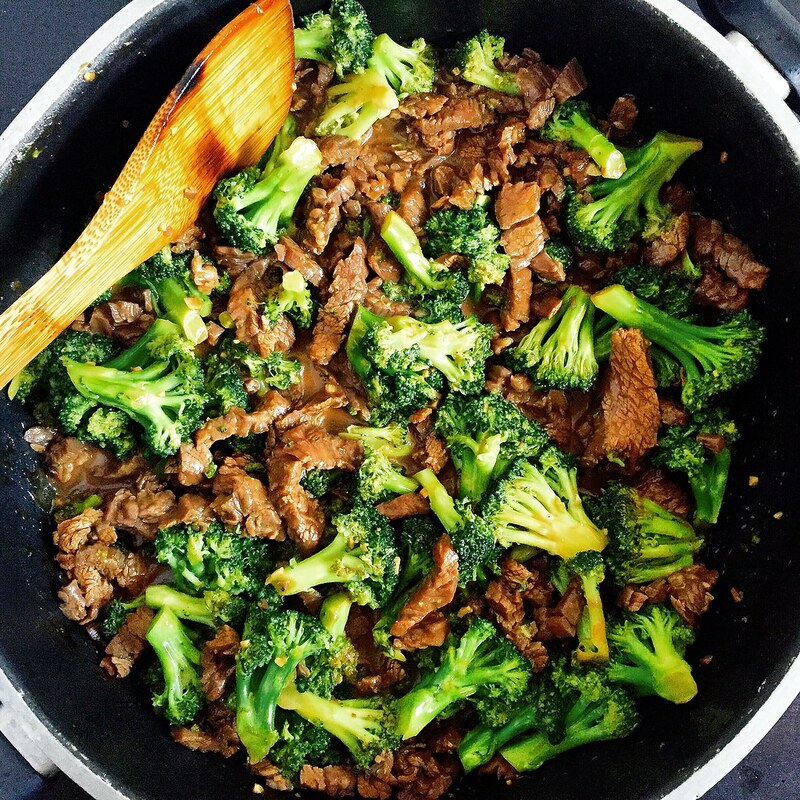 You'll want to use a large pan with a lid so that you can steam the broccoli after a quick stir fry. My favorite part about this recipe is the marinade which ends up becoming the sauce upon stir frying with the beef. It is already quite fragrant due to the soy sauce, garlic, and sesame oil, but my mom adds a secret ingredient that really brings it over the top: cinnamon! Only a tiny amount is added that you can't really taste it, but the aromatic spice somehow boosts all the other flavors in the sauce in a way you wouldn't expect. Whisk together the soy sauce, cornstarch, rice wine, sesame oil, sugar, minced garlic, and cinnamon. Toss with the sliced steak and marinate for at least 30 minutes. 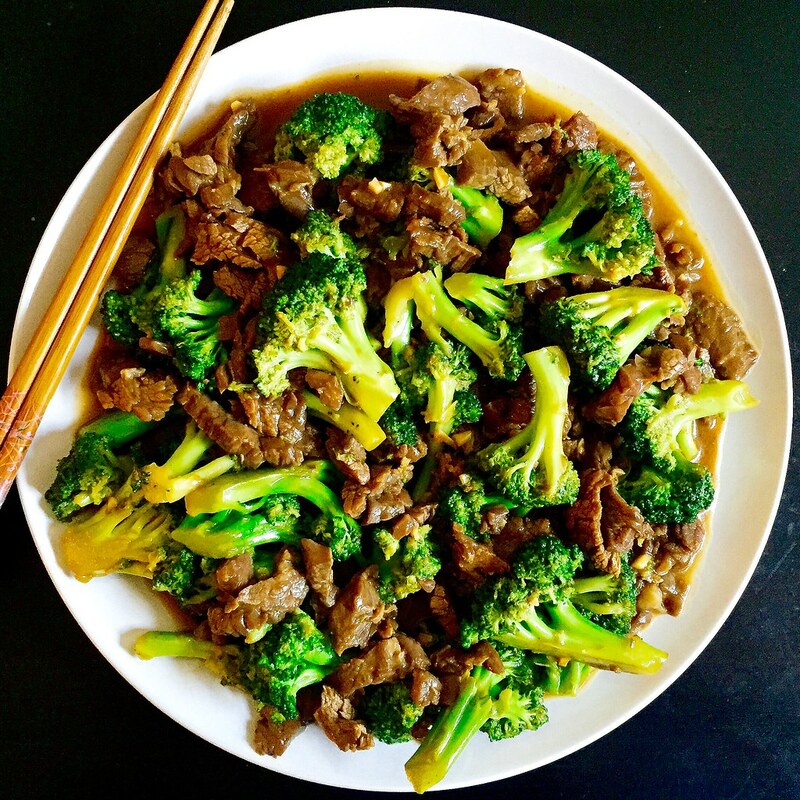 In a large frying pan, heat 2 tablespoons of oil on high and add the broccoli florets. Season with salt and stir fry until bright green. Add 1/2 cup water and cover. Steam until the broccoli is done. Transfer the broccoli to a bowl, and wipe down the pan. Add another 2 tablespoons of oil and heat on high again. Add the steak and marinade to the pan. Rinse out the container you used to hold the beef with 1/2 cup of water and add to the pan. Stir fry until the beef is just done and no longer red. Add the broccoli back into the pan and continue to stir fry for another minute or two to combine. Serve hot. 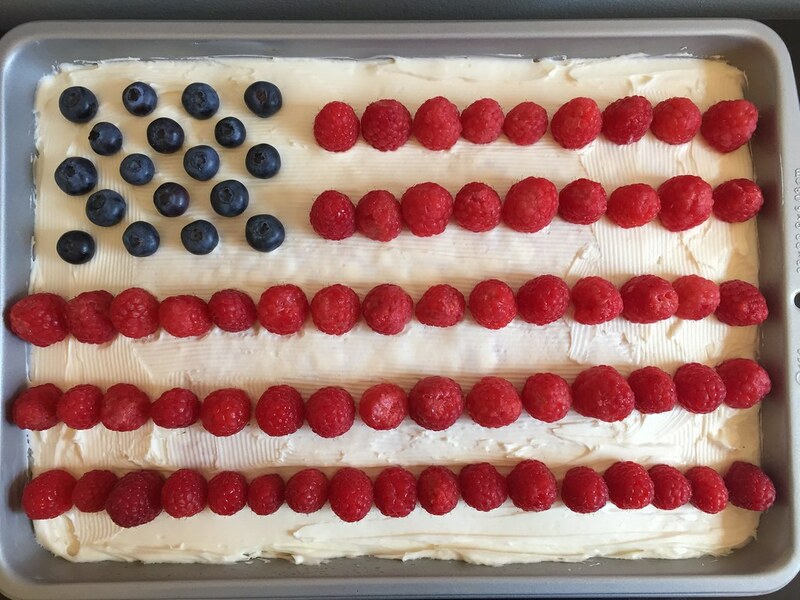 I've been wanting to make an American flag cake for the 4th of July and had pinned several possible versions including this one from Food52 and this ice cream cake version from the Food Network. But the problem with those round layer cakes though is that I only had one round cake pan and no way to transport the finished product. I wasn't too keen on having to pull out my piping bag to make Ina Garten's (or as Brit + Co called it, Taylor Swift's) version either, so when I came across Smitten Kitchen's version from four years ago, I was truly smitten. 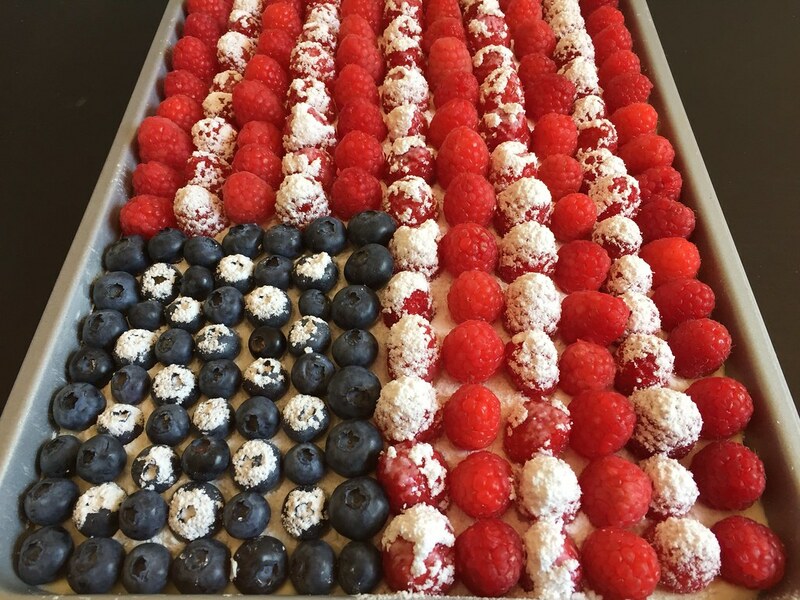 Not only was it a single layer rectangular cake, but all you needed was some powdered sugar to make the "stars" and stripes! In her post, she includes a recipe for the cake and frosting, but I cheated by making the cake with a box mix and using store bought frosting. After baking the cake, allow it to cool completely before frosting. If it's domed on top, you can level it with a serrated knife or just do as I did and "spackle" in the sides with frosting so the top is level. 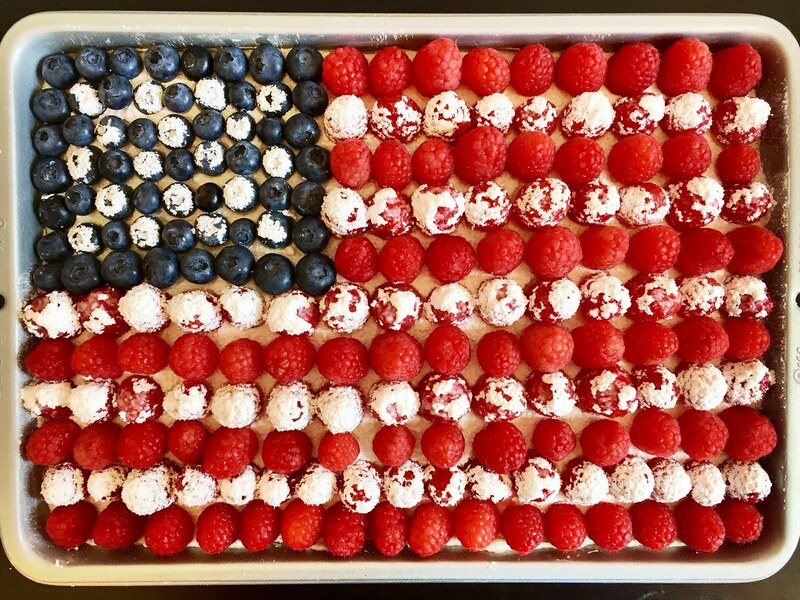 While the cake is baking, wash and dry the berries. 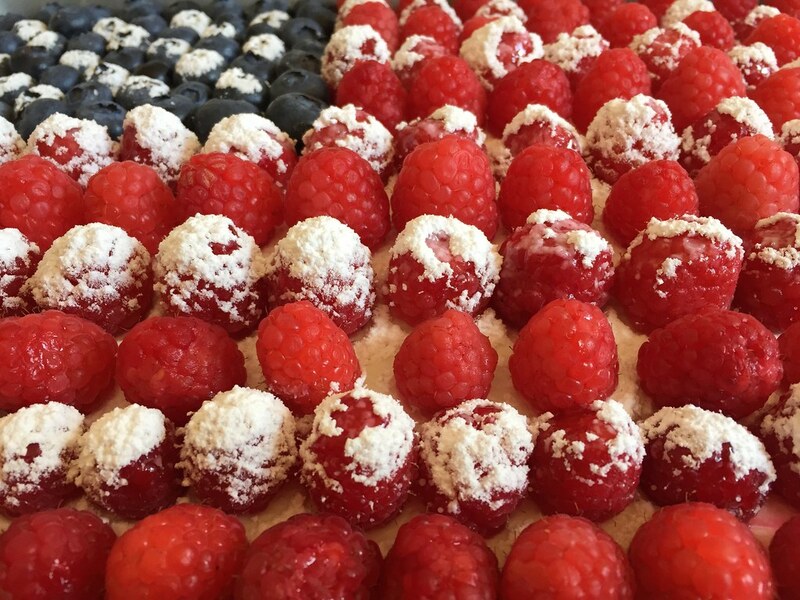 While the cake is cooling, you can start arranging the berries to make sure you have enough. 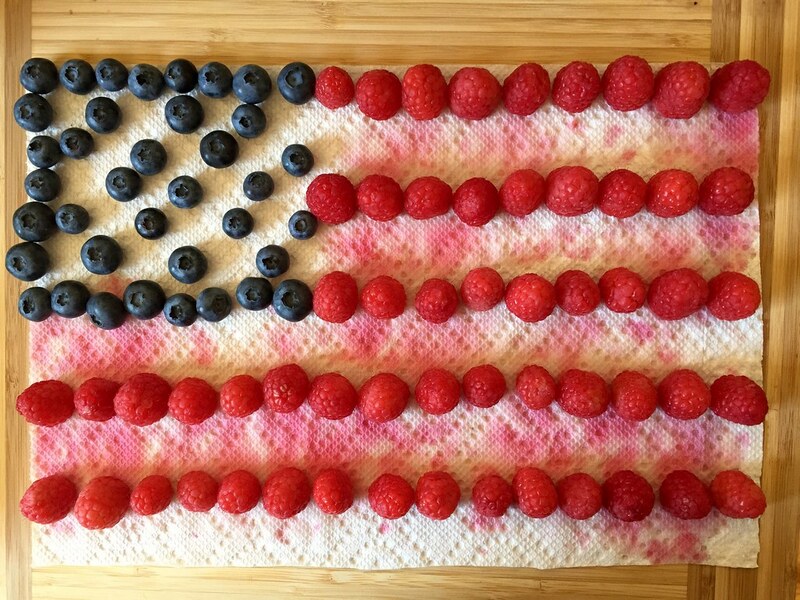 I used a piece of paper towel that was the same size as the cake to plot out the berries on. The blue part takes up about half the short side of the flag and extends about a third of the way across. 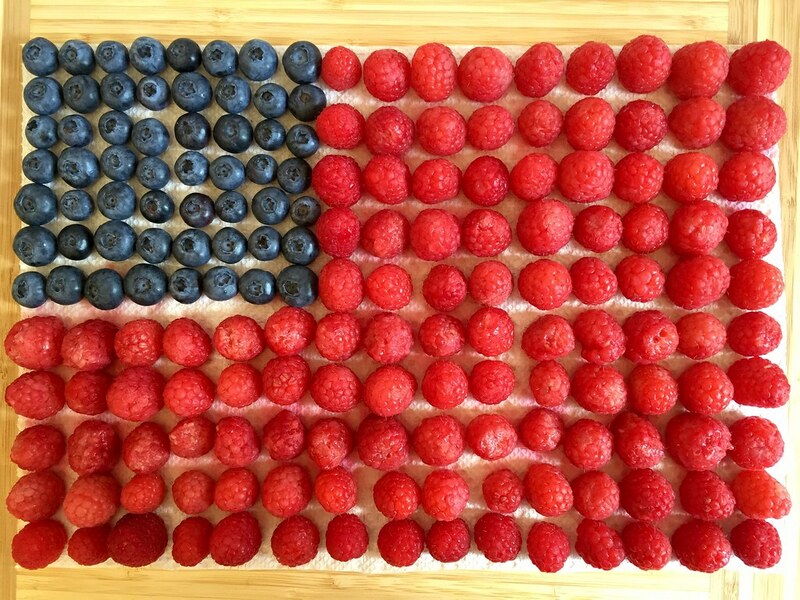 There are 13 stripes (one for each of the original colonies; yay AP American History!) but you probably won't be able to fit that many on the cake. If you can, try to make an odd number of stripes so that the top and bottom stripe will be red. After frosting the cake, start putting the berries that you want to appear white on the cake, leaving room for the other berries. Dust these with powdered sugar, then arrange the rest of the berries into the spaces left for them. In reality, it took a lot longer to make than I thought. The first batch of raspberries I bought were overripe and broke apart when I was washing them, so I had to go back to the store to buy another pint. Then I made the mistake of not completely drying the raspberries before decorating the cake, so the powdered sugar started to melt before I could even take any pictures. But if you learn from my mistakes, it's actually not that hard to make and totally worth it! Not only is it super impressive to bring to a party, the fresh fruit on top of the cake is really, really delicious! Fun fact: if you can someone figure out how to make the starburst design, you can also use this template to make the Taiwanese (or more accurately, the R.O.C.) flag! 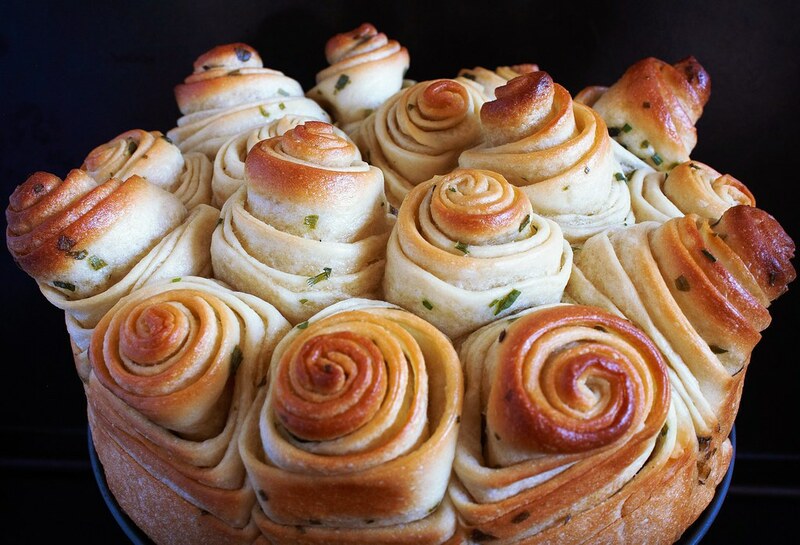 I first had this cake at my friend Evie's Epiphany Party last year, and it was truly an epiphany. 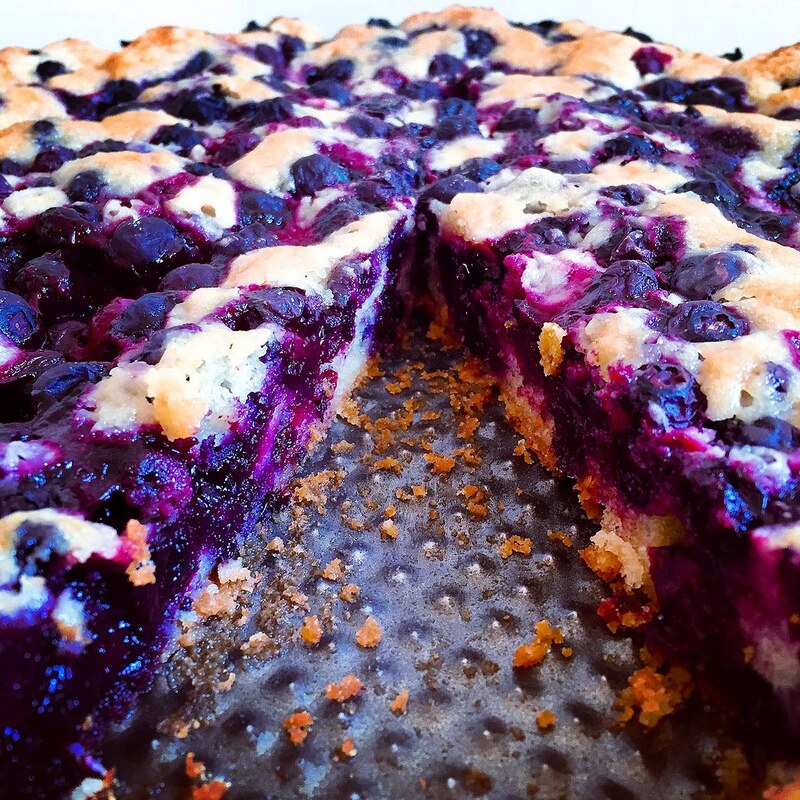 I never knew homemade cake could taste so good--so buttery and moist and bursting with blueberries! I e-mailed Evie immediately after the party to ask for her friend's recipe, and it turns out it's from a bed & breakfast in Maine. 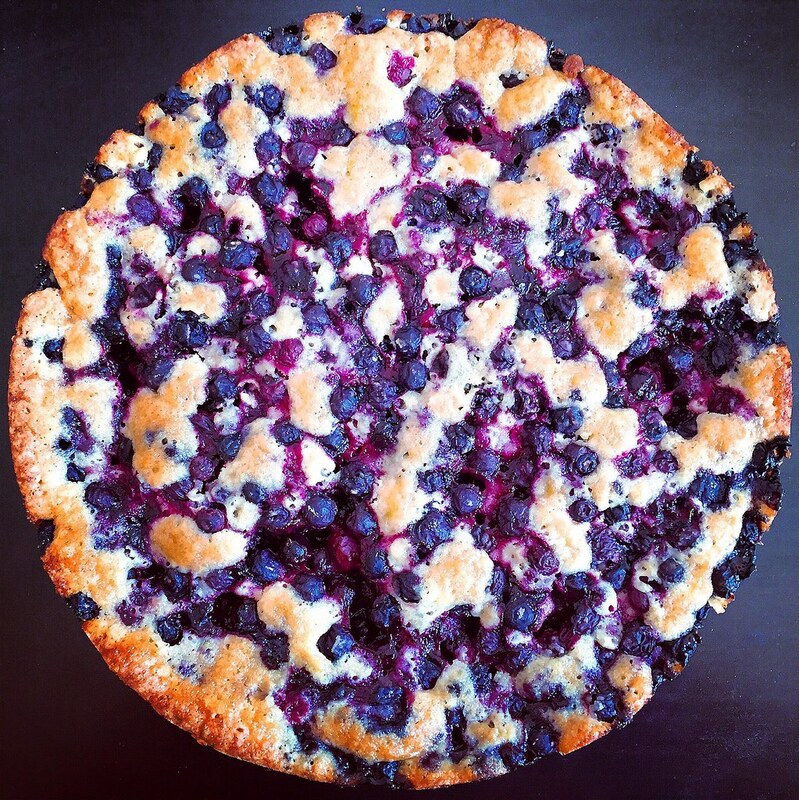 The first time I made this cake I made it in a pie pan (because I didn't have a 9" pan) and used frozen wild blueberries. It was quite tasty but not as pretty so I dusted it with powdered sugar as instructed in the original recipe. When I made it this time I used a 10" springform pan and fresh blueberries, and it looked nice enough to forgo the powdered sugar dusting. Don't worry if you think the cake batter to fruit ratio is off. 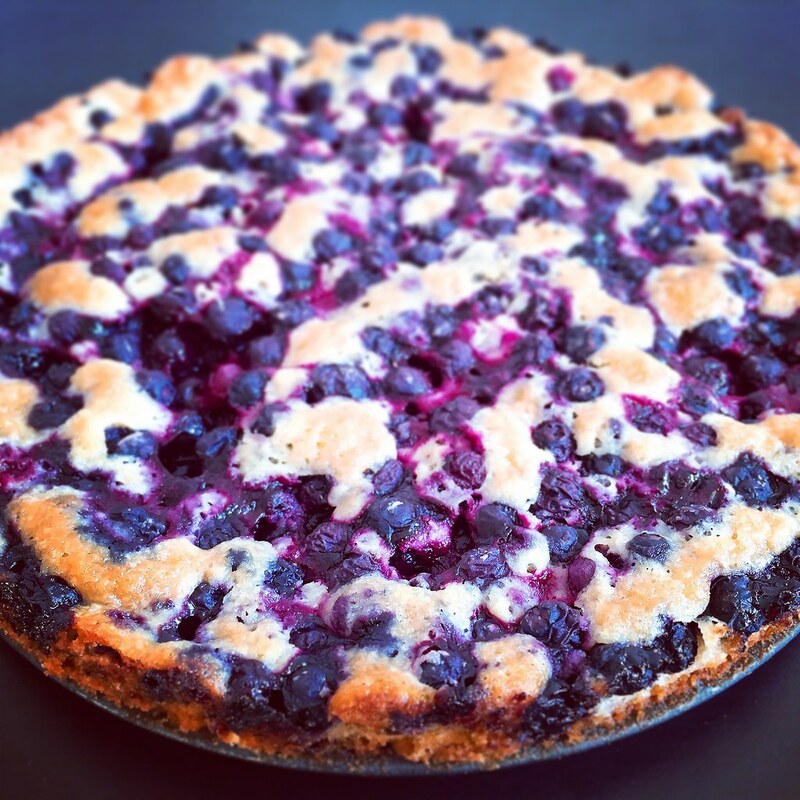 You will be spooning a lot of blueberries on top of the batter, but while the cake bakes in the oven the blueberries sink while the cake rises so it's perfect by the end. Lightly grease a 9- or 10-inch springform pan and dust with flour. In a small bowl, combine 1 cup of the flour with the baking powder and salt and set aside. Using an electric mixer on medium-high to high speed, cream the butter, sugar, and vanilla until light and fluffy, about 3 minutes. Add the eggs one at a time and continue beating until well blended. Reduce the speed to low and gradually add the flour mixture. Beat until smooth. Pour the batter into the prepared pan. 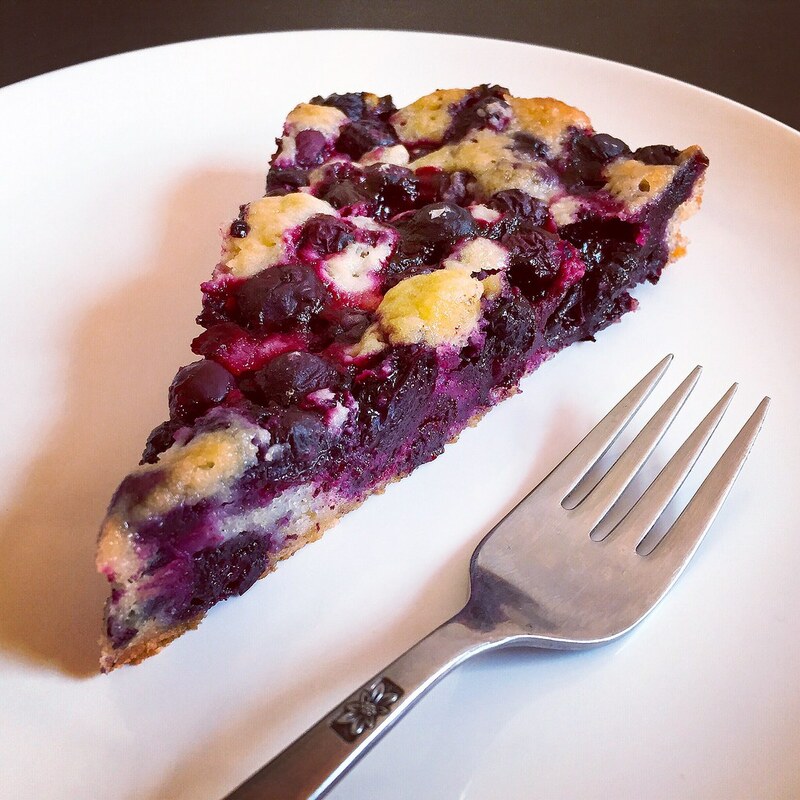 In a medium bowl, combine the blueberries with the remaining teaspoon of flour and the lemon juice. Spoon the berry mixture over the batter. Bake for 50-55 min, or until a cake tester or toothpick inserted in the center comes out clean. Remove from the oven and let the cake cool in the pan for 10 minutes. Slide a thin knife around the edges of the cake to release it from the pan before you release and remove the springform. Dust the cake with confectioners' sugar before serving, if you want. I already had a trip to France and Italy planned when I found out I would need to be in Madrid the following week for work. 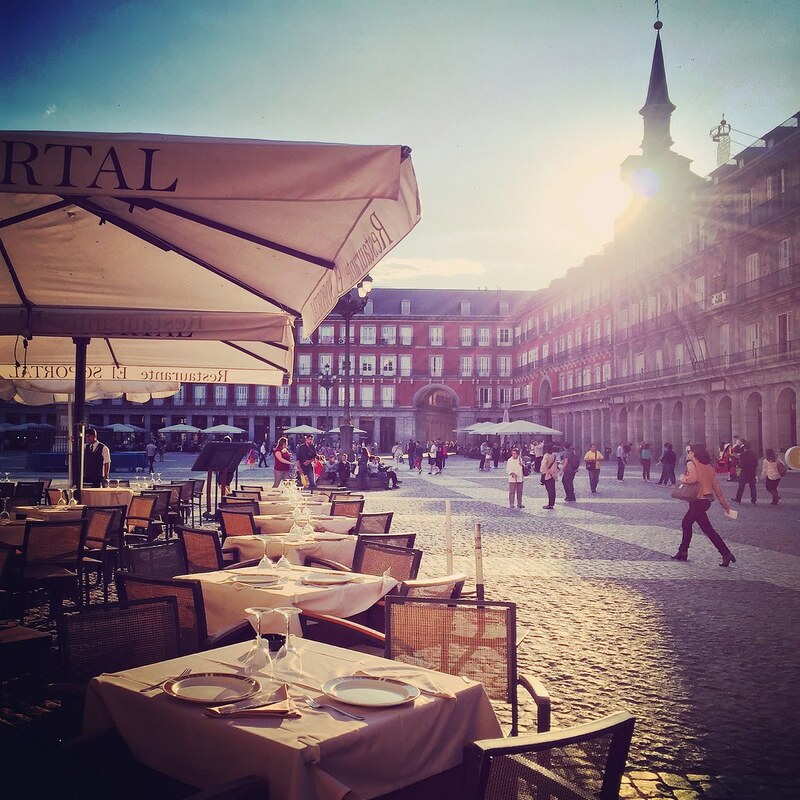 So after some quick thinking and planning, I managed to extend my time in Europe for another week and head out to Madrid a few days early before the meeting! Eating chocolate con churros every day for breakfast! 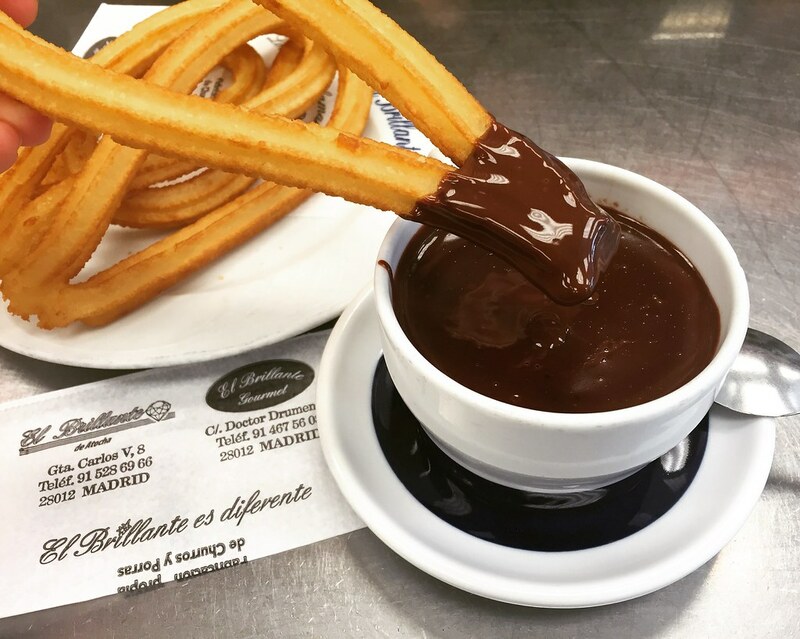 We liked going to El Brillante for the authentic Madrileño experience and learned about purros there, which are basically, bigger, fatter churros that really remind me of Taiwanese you tiao. We also tried them at Chocolatería San Ginés since everyone says they have the best ones, and I did like them more because they were less greasy and the hot chocolate wasn't as sweet. One of Sarah Ruth's friend's boyfriend was a local, and he was kind enough to take us around 2 of the 3 nights we were free. 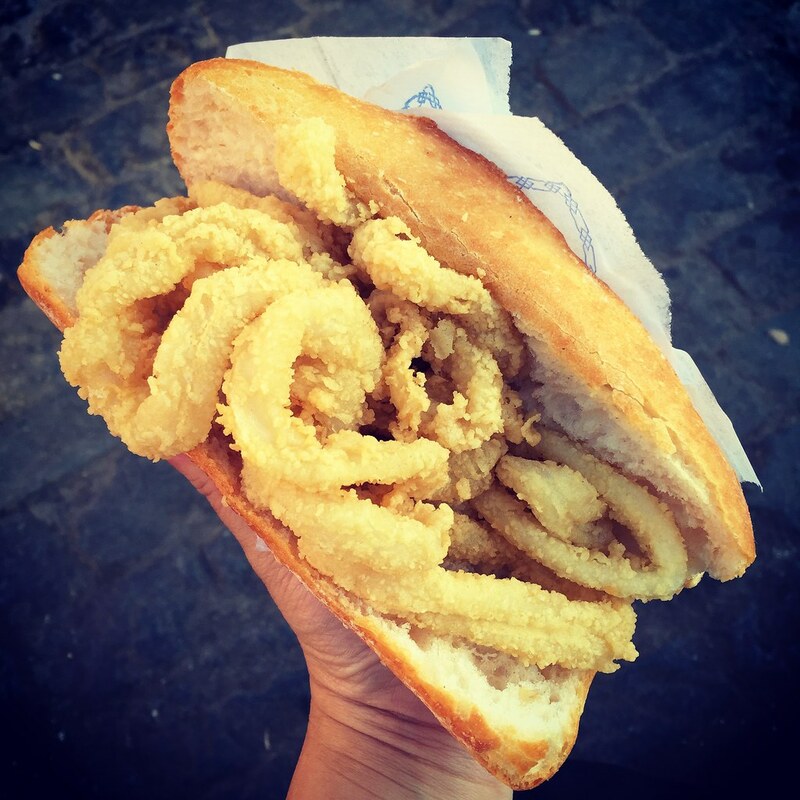 I really wanted to try Madrid's specialty--bocadillo de calamares--which is basically like a fried calamari po'boy. He took us to La Campana just off of Plaza Mayor, and the sandwich was a lot bigger than I expected! It was pretty good, but I would've appreciated some type of sauce on there like a spicy remoulade or an aioli or something. I bet it would be really good at 3 am after a night of partying! Another one of his suggestions was a Chinese restaurant that was located...in an underground parking garage. I totally thought it wouldn't be worth even seeking, but then we looked on-line for it, and it seemed like the real deal. So after more than 10 days without Asian food, I was desperate enough to try it out. You guys, it was awesome! It honestly tasted like something my mom would make! 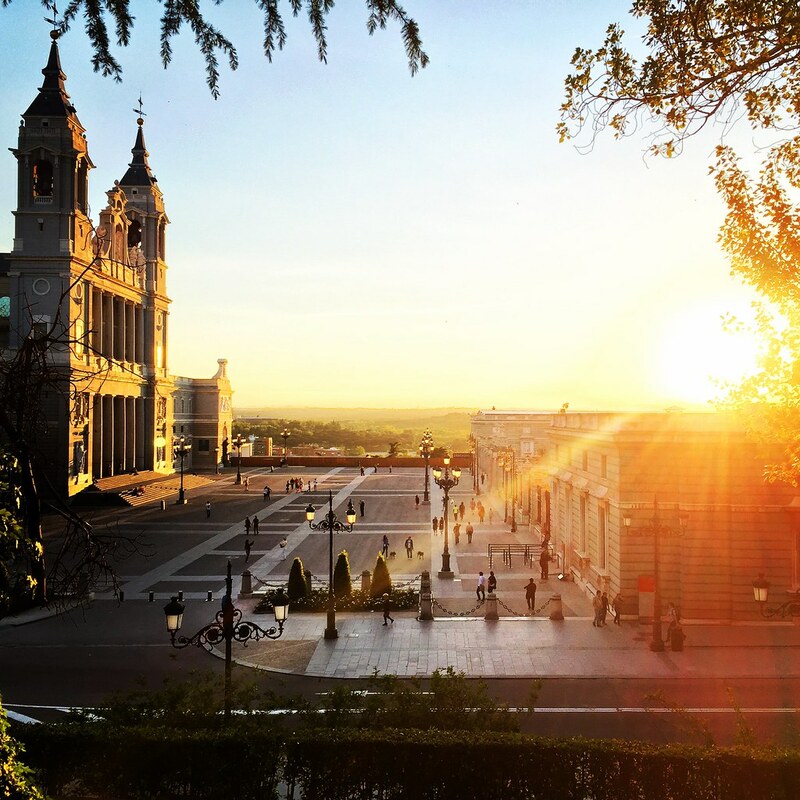 To find it, go to the southeast corner of Plaza de Espana and look for the stairs that go down. Can't miss it. We went to La Latina for tapas one night, but I was so tired we only made it to two bars . My favorite was Juana La Loca. They had the best tortilla I had in Madrid, probably because they caramelized their onions for extra flavor. 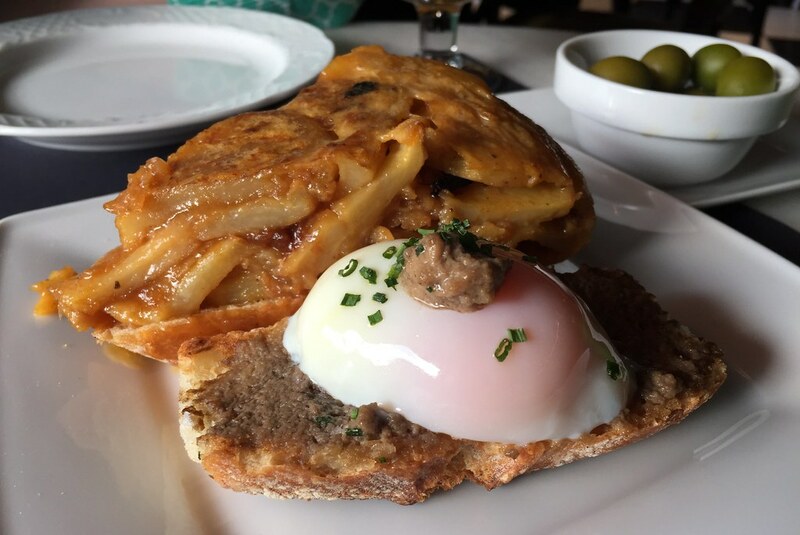 They also had El Increible, a soft-cooked egg with truffle paste on bread. It was amazing. I loved that they also had some dessert options for tapas, although we didn't try any. 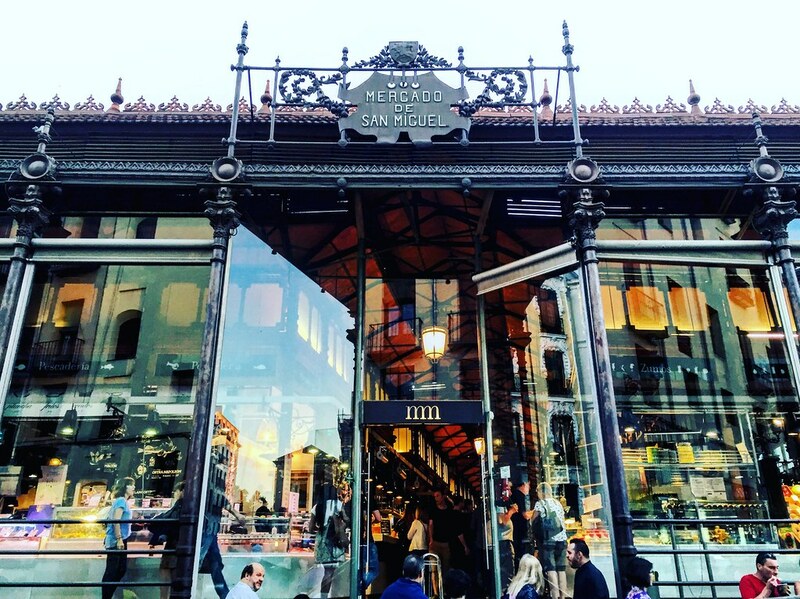 Mercado de San Miguel is like the Fanueil Hall/Quincy Market of Madrid (super touristy food court) but it's so beautiful I can't help loving it. They have a paella stall with four kinds of paella, and you can get a ración (single serving) instead of having to order enough for at least 2 people like every other restaurant. I tried the paella negra which was colored with black squid ink. The guy scraped up some of the crusty bits from the bottom of the pan so it had a nice combination of textures. There were a lot of great places to watch the sunset. 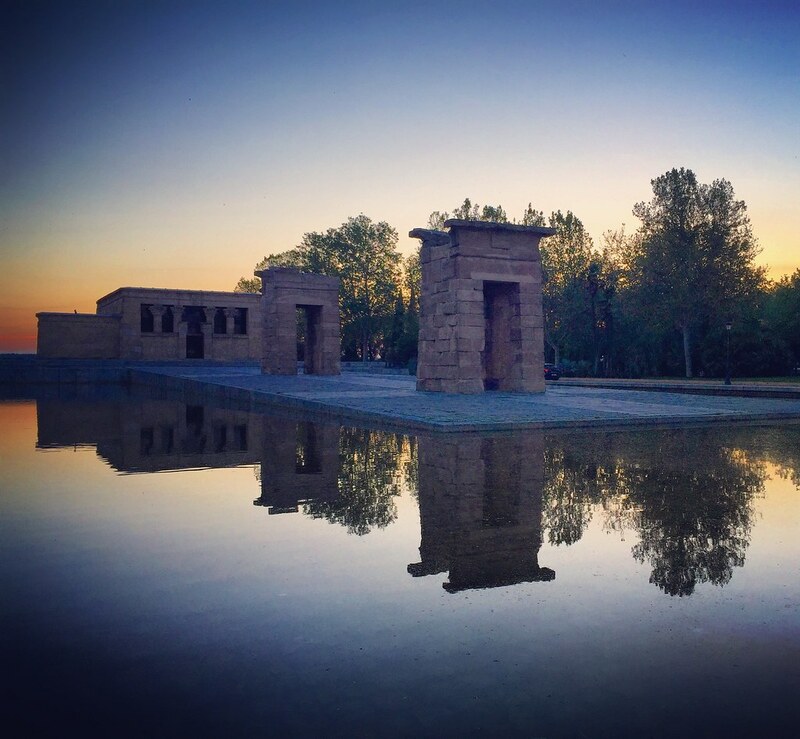 Two of mine were next to the Royal Palace and the Temple of Debod, which was moved from Egypt when the building of a dam threatened to flood it (similar to how the Met in NYC got the Temple of Dendur). 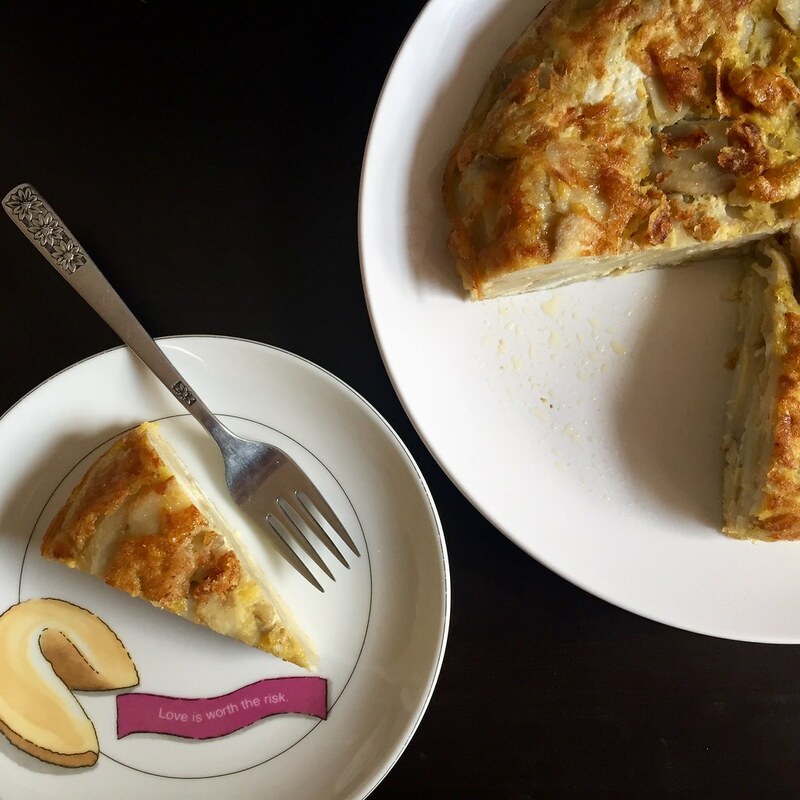 After returning from Madrid, I knew I wanted to try making the iconic tortilla española at home. I settled on Mark Bittman's recipe with a few tweaks. Instead of a whole cup of olive oil, I used half olive oil, half vegetable oil, mostly for budgetary reasons. 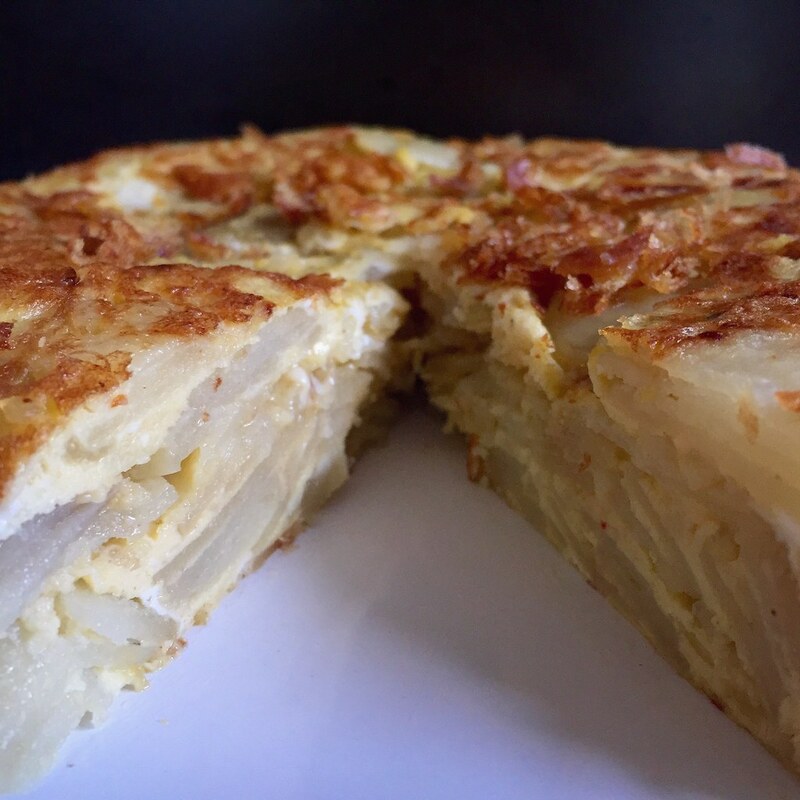 It's still a lot of oil, though, but you can strain it and save it in the refrigerator for the next time you make tortilla española. I also started cooking the onions before the potatoes to try get some caramelized flavor into the tortilla, à la Juana La Loca. They were just starting to brown on the edges when I added the potatoes, but I think next time I'll wait even longer since they didn't really end up caramelized by the time the potatoes were done. Lastly, instead of just salt and pepper, I used this awesome Spanish flavored sea salt I picked up from El Corte Inglés that was seasoned with hot pepper, rosemary, black pepper, garlic, onion, parsley, and tomato. 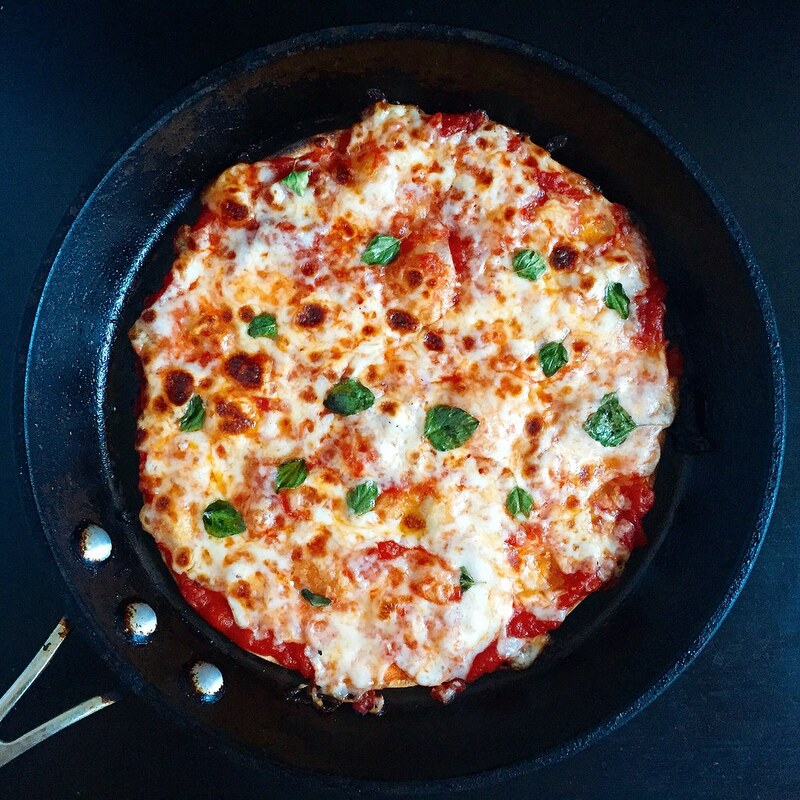 Heat the oil in an 8- or 10-inch non-stick skillet over medium heat. Chop the onions and add to the oil with some salt and pepper. Stir occasionally while you prepare the potatoes. Slice the potatoes thinly, using a mandoline if you have one. Add to the oil along with some more salt and pepper and adjust the heat so that it bubbles lazily. Cook until the potatoes are tender, but not brown. 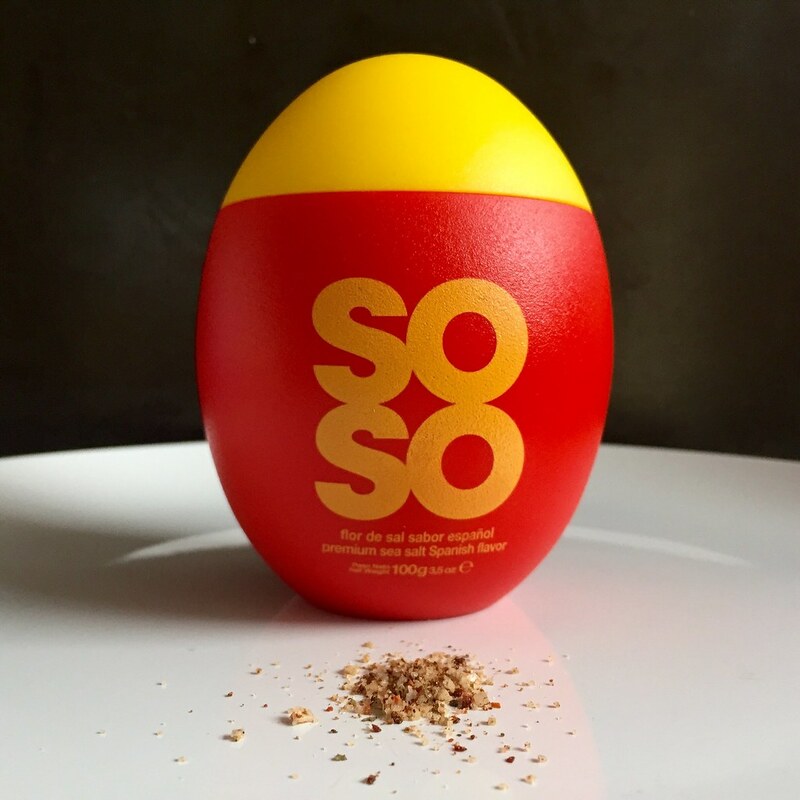 While the potatoes are cooking, beat the eggs with some salt and pepper. Drain the potatoes and onions in a colander, reserving the oil. Wipe the skillet clean and add two tablespoons of oil back to it. Heat over medium heat. Add the potatoes to the egg mixture and mix gently. Transfer to the skillet. After the edges firm up, about a minute or so, reduce the heat to medium-low and cook for 5 more minutes. Use a heat-proof rubber spatula to loosen the edges of the tortilla. Place a large plate on top of the skillet and flip the tortilla onto it. Add another tablespoon of oil into the skillet and slide the tortilla, cooked side up, back in. Cook for another 5 minutes, using the spatula to coax the sides of the tortilla into a domed shape. 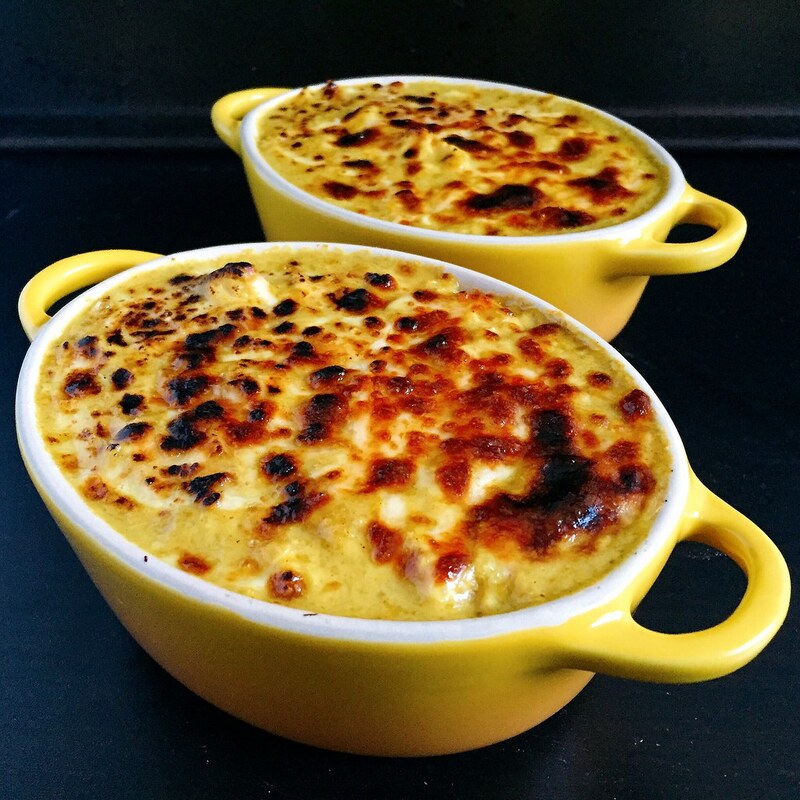 Slide onto a plate and serve warm or at room temperature.